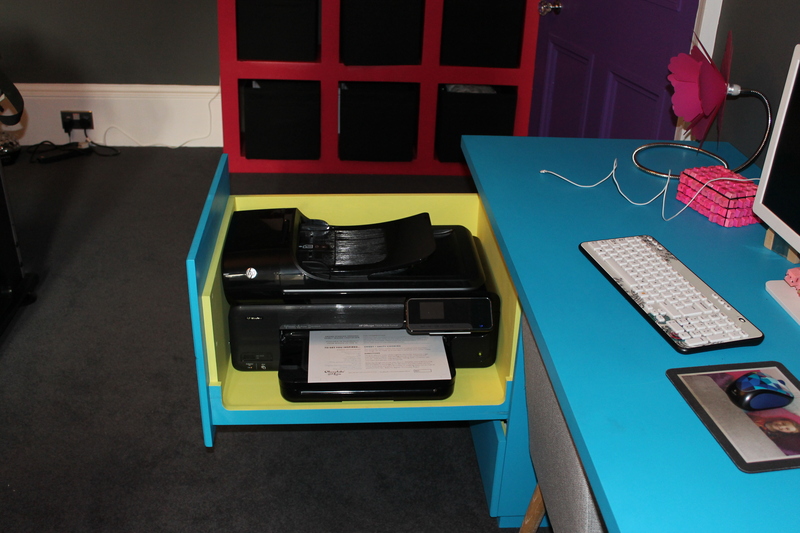 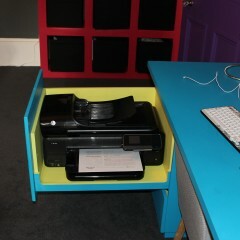 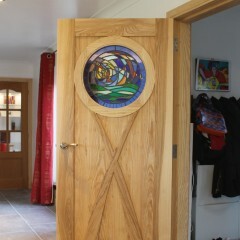 Photographs are for illustration purposes only – as almost anything is possible at Ecosse Bespoke! 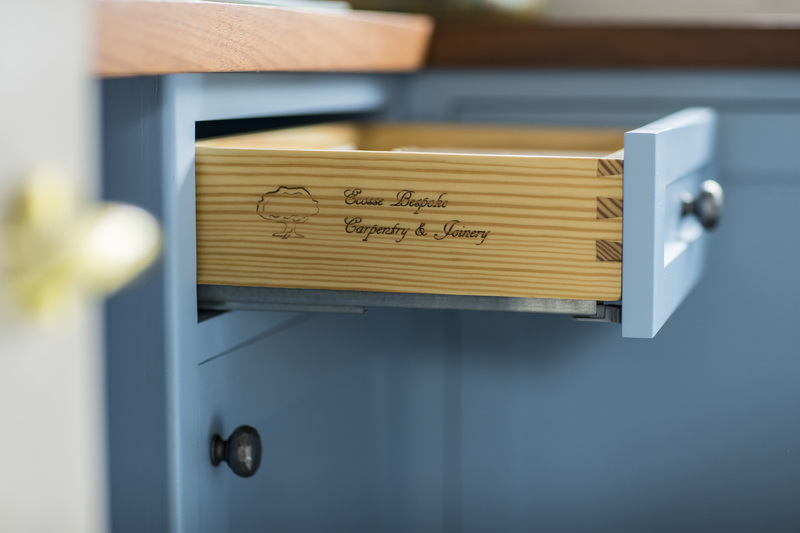 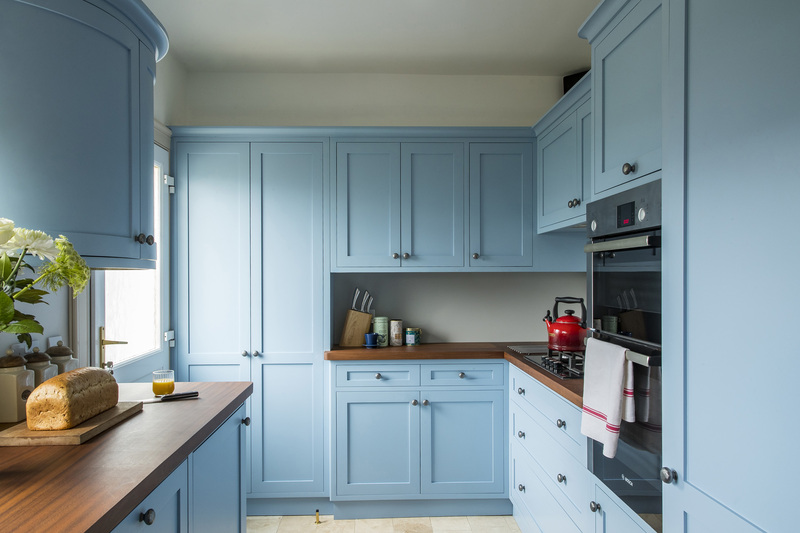 The heart of many homes, your bespoke kitchen can have custom-made hardwood cabinets, dovetail drawers and doors designed to your taste. 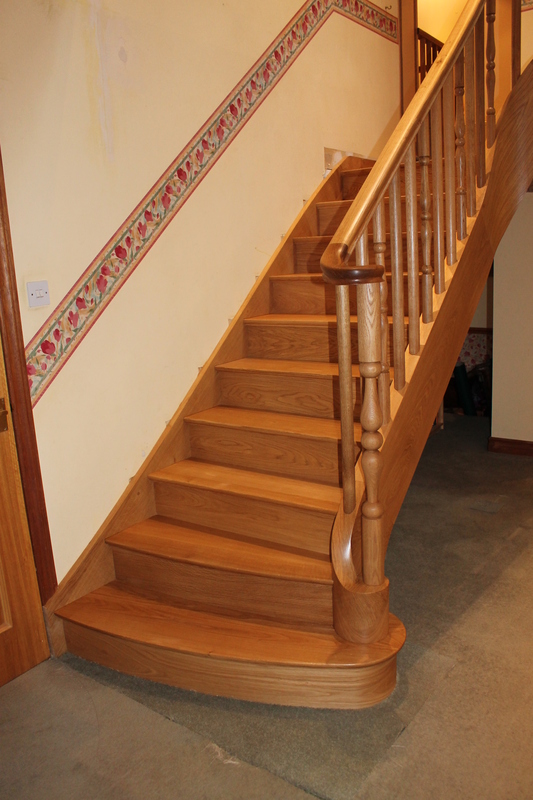 A wooden staircase can often form a stunning centrepiece in a home or hallway. 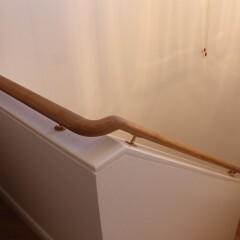 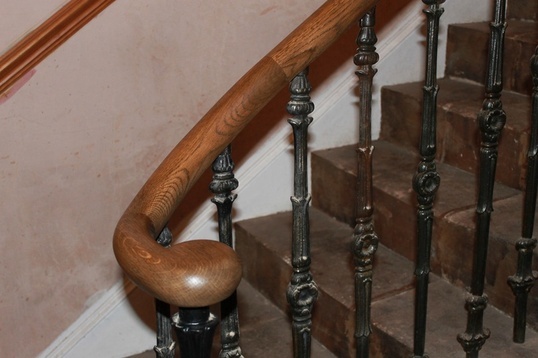 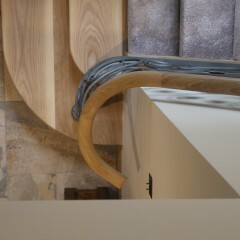 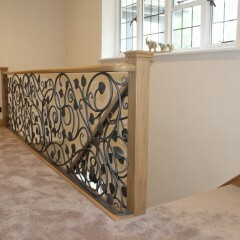 Especially if it features hand-made handrails, spindles or balustrades. 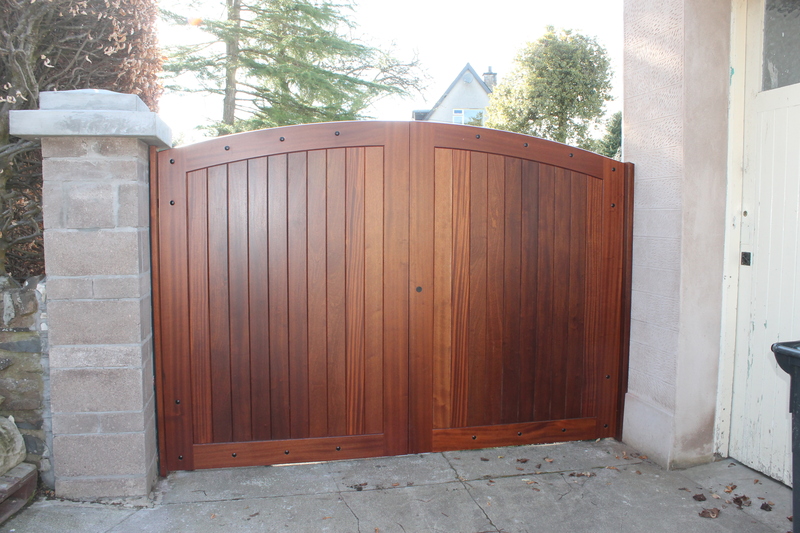 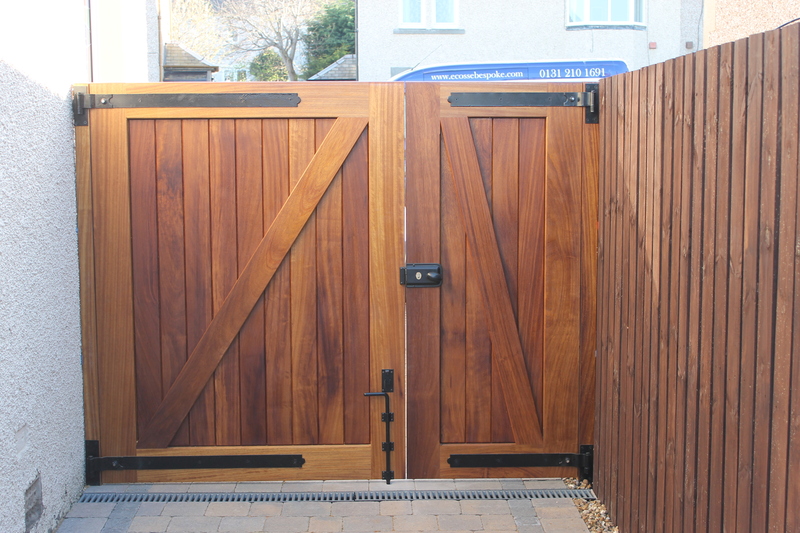 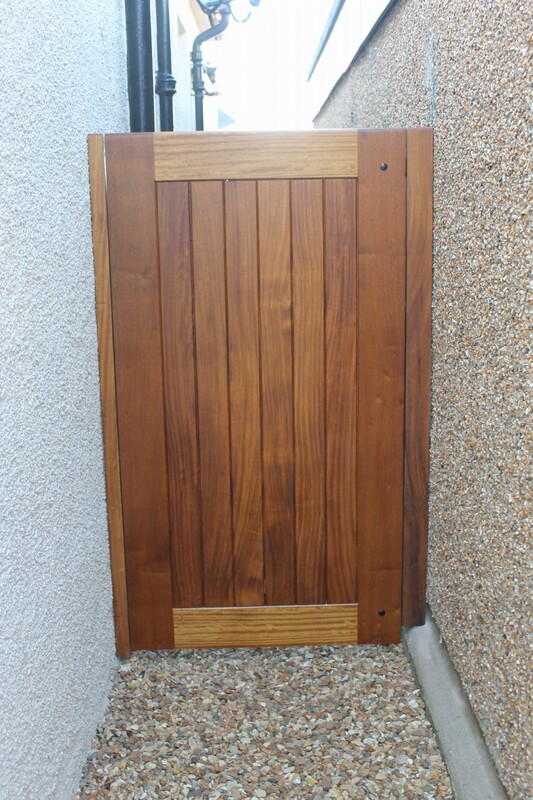 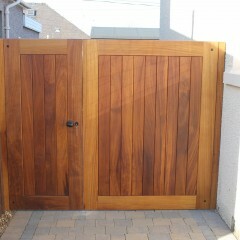 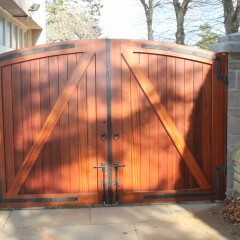 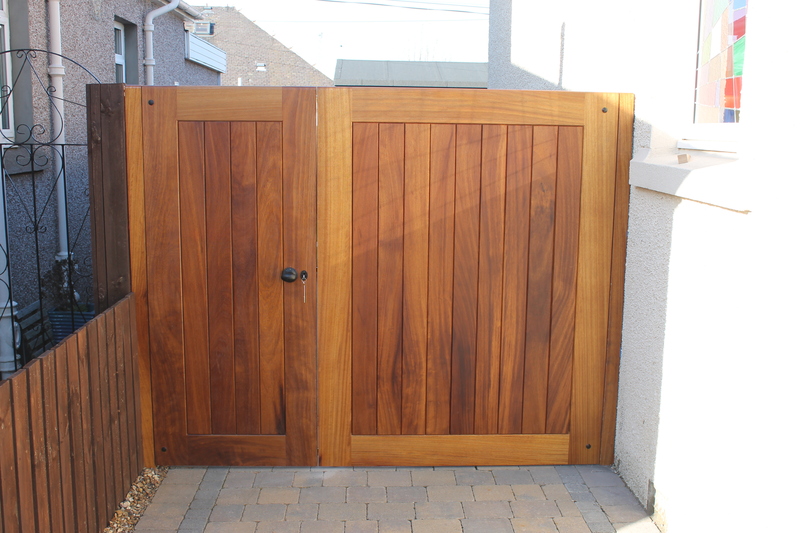 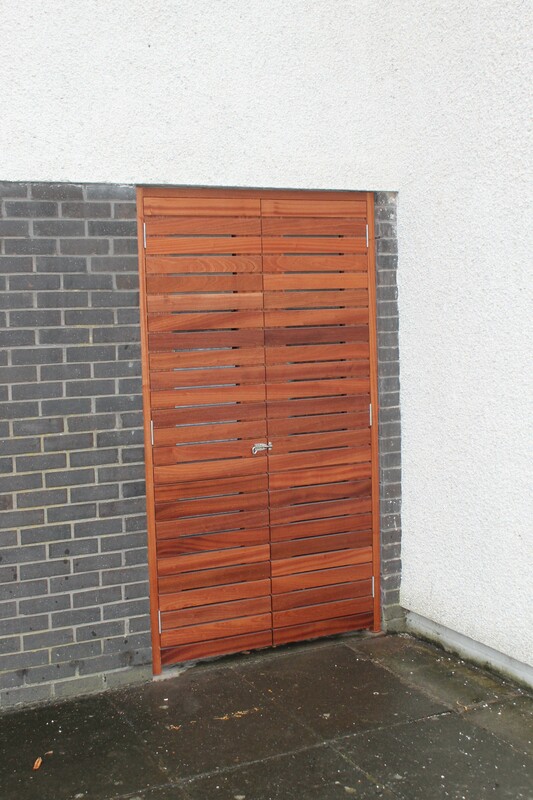 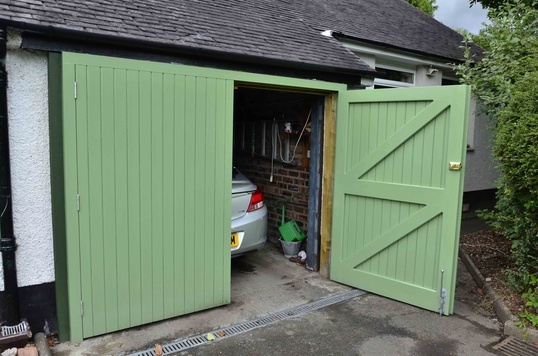 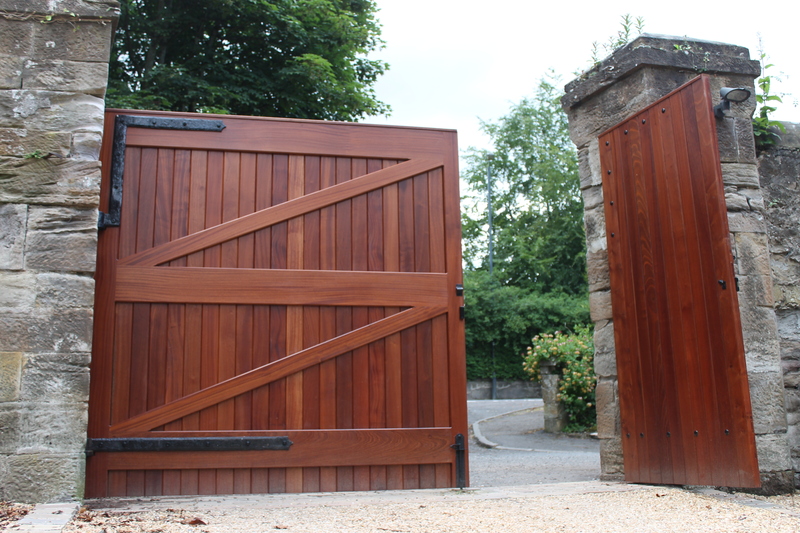 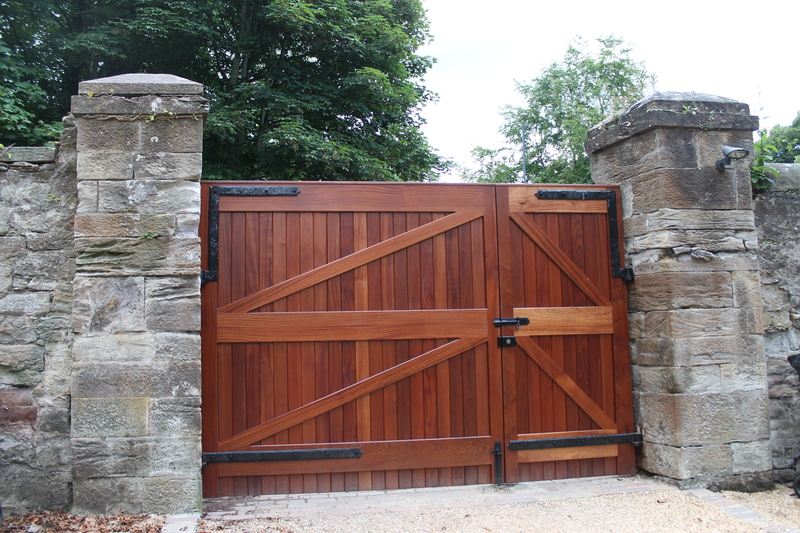 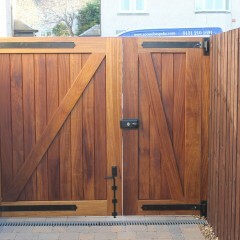 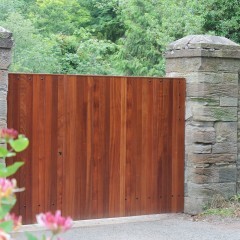 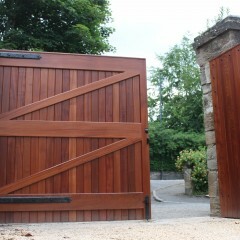 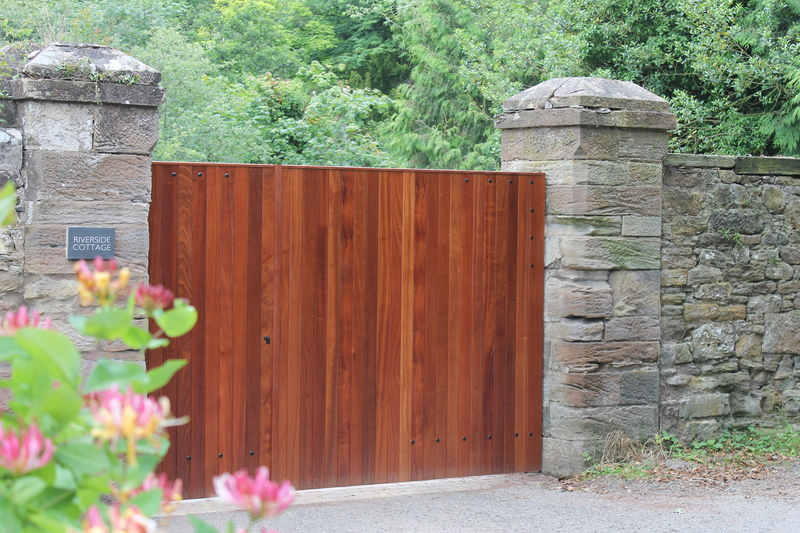 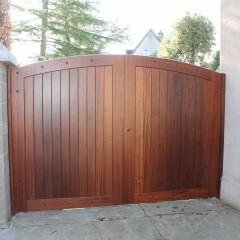 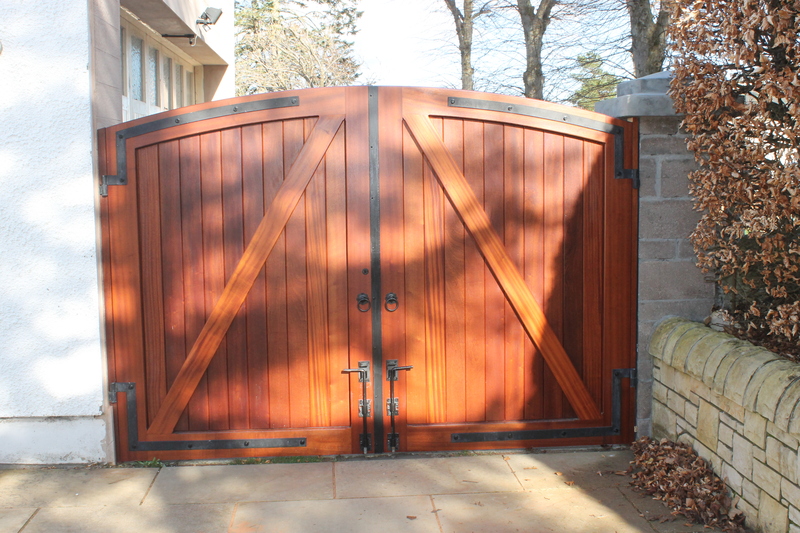 Our gates are assembled with traditional wedged mortise/tenon joints to stand the test of time. 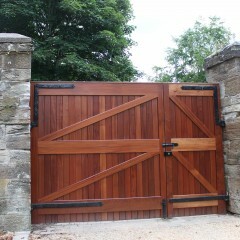 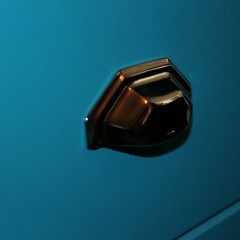 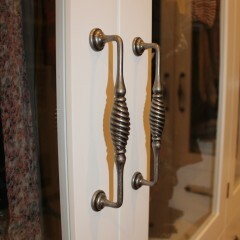 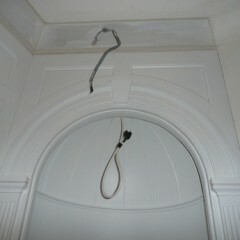 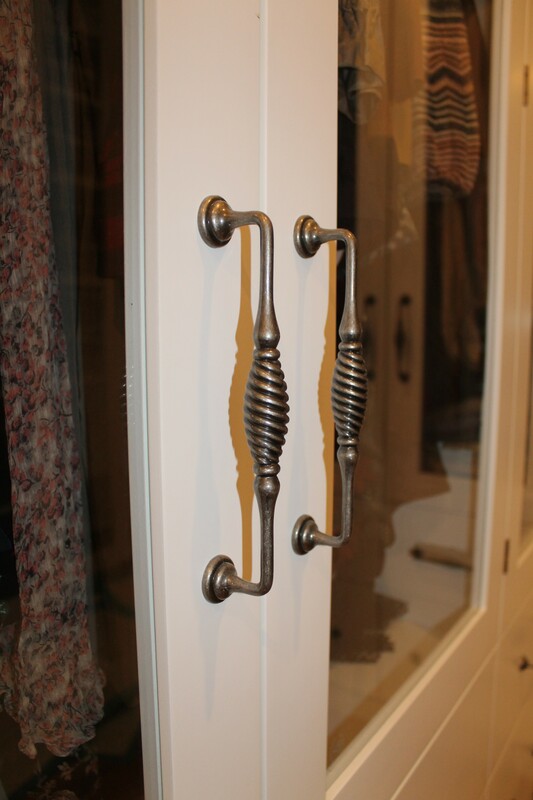 We can also work in collaboration with a blacksmith to get tailor made hinges. 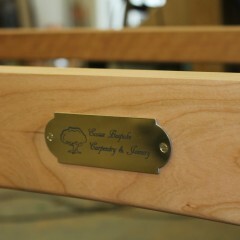 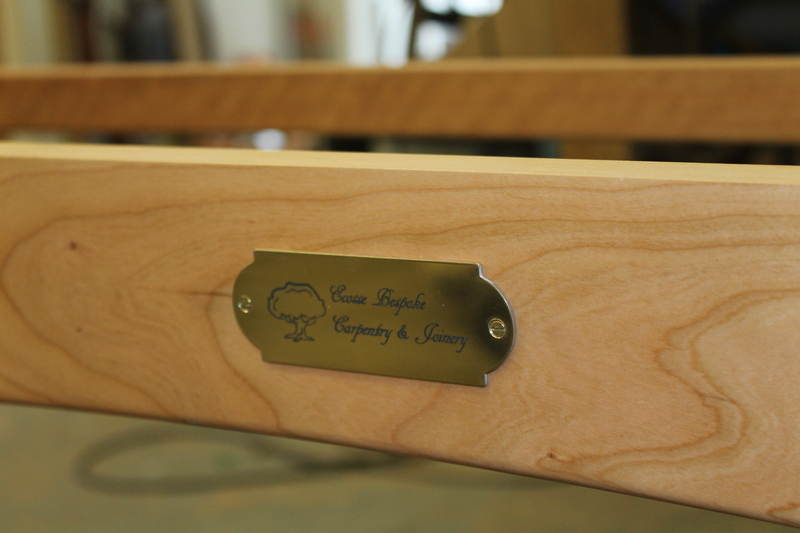 Beautifully made furniture can last a lifetime. 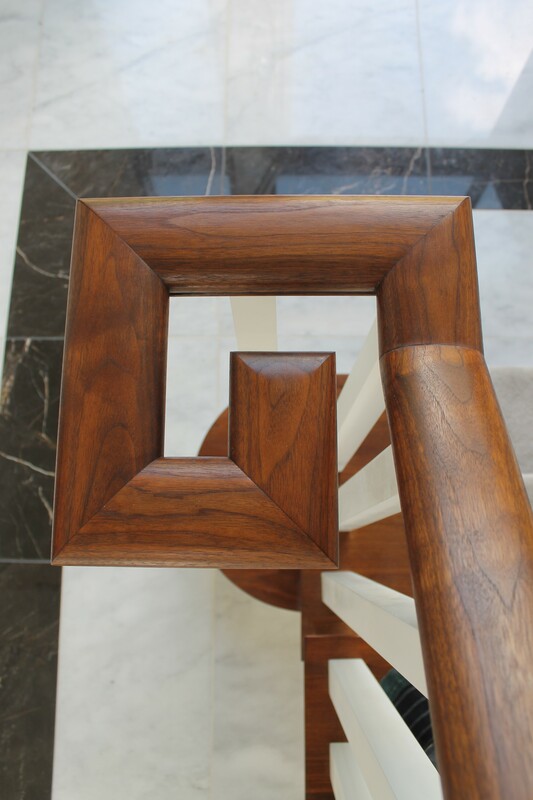 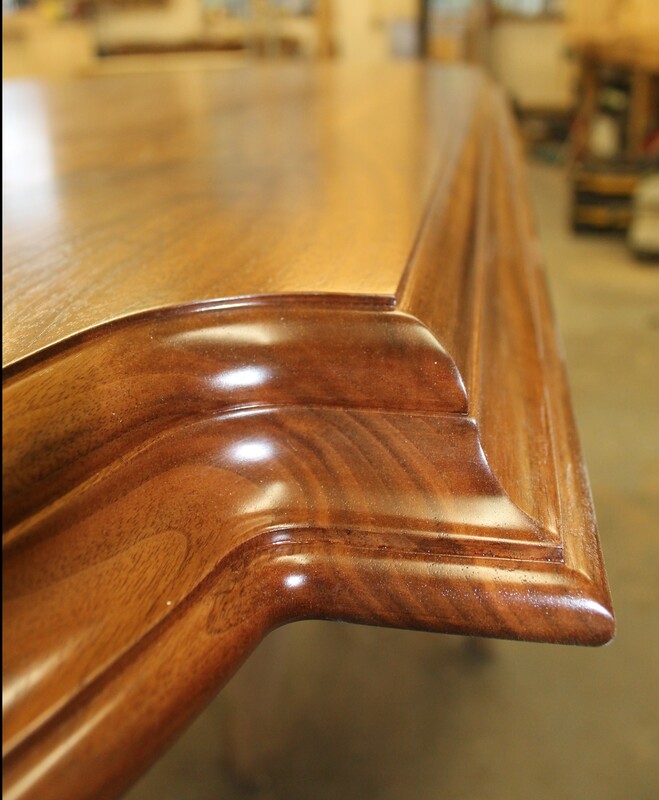 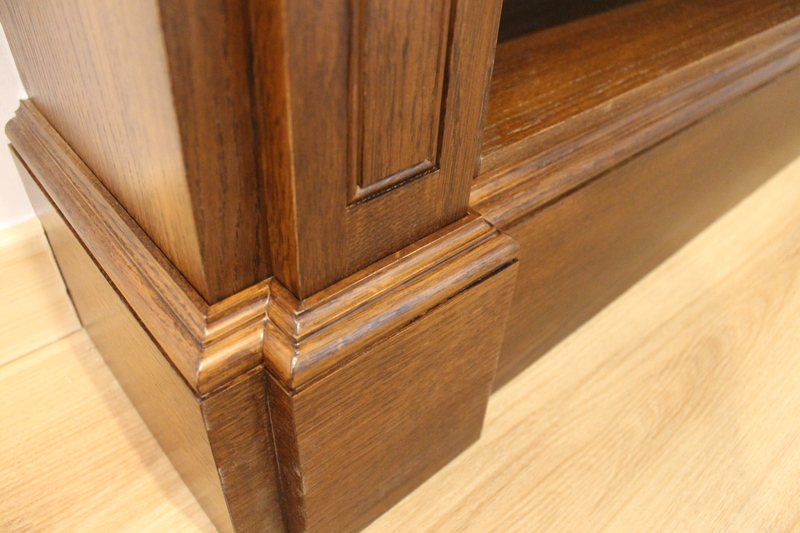 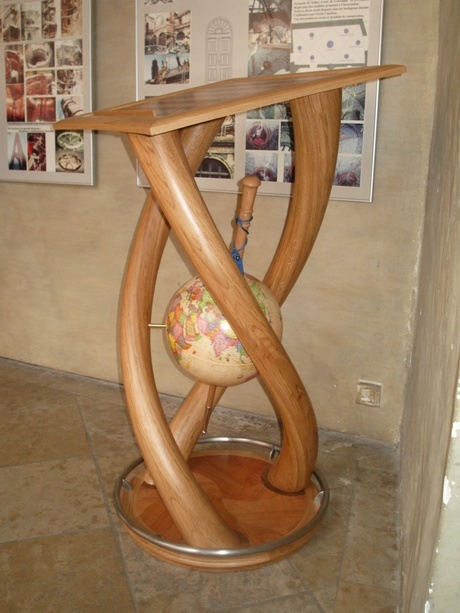 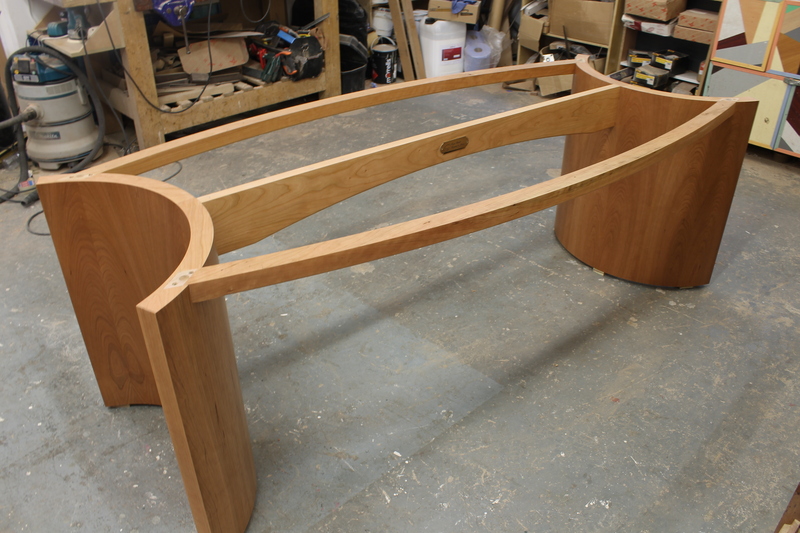 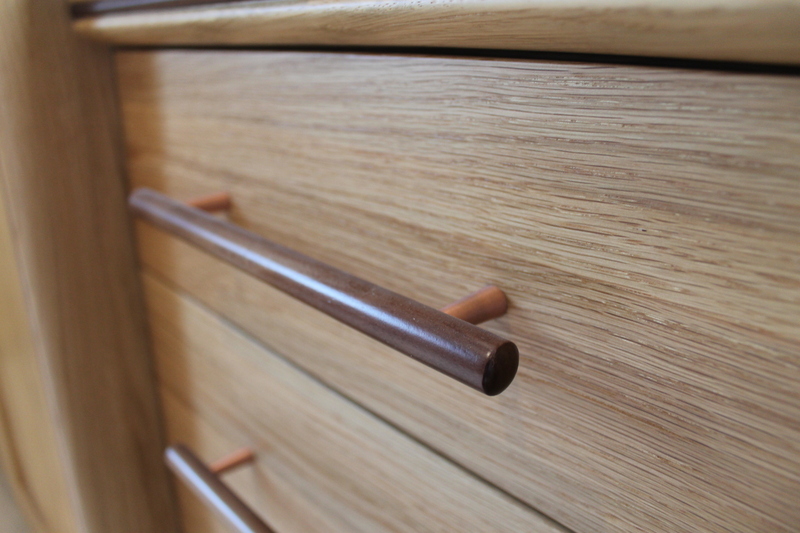 At Ecosse Bespoke, we use the most appropriate parts of the wood to suit the piece of furniture so that the wood’s natural colours and beauty can be truly appreciated. 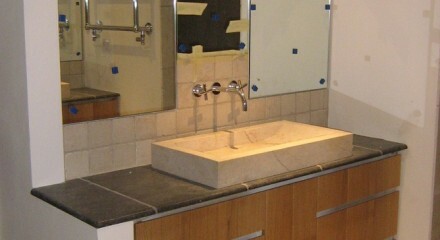 Bathrooms should always be luxurious. 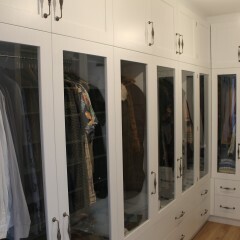 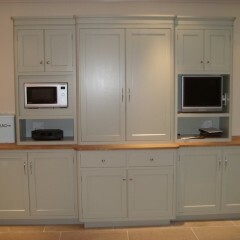 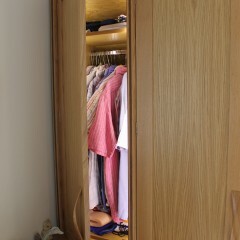 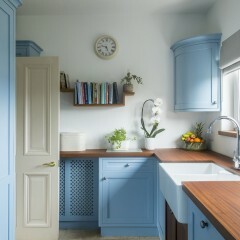 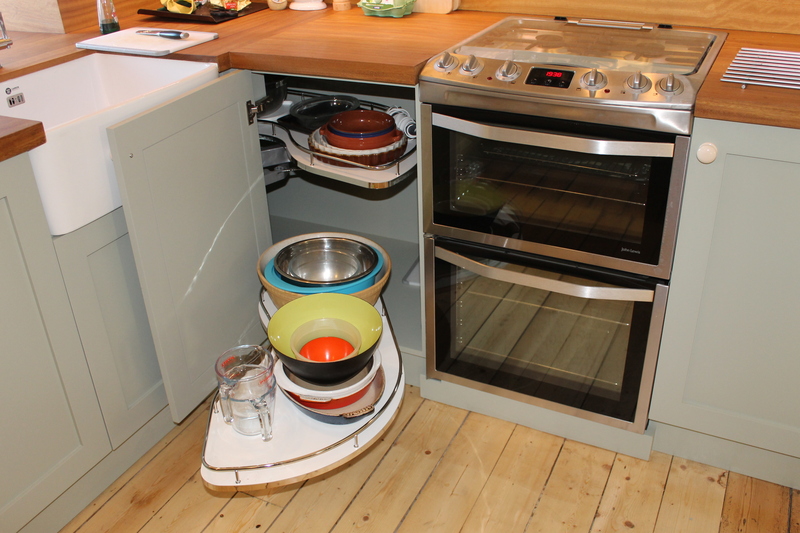 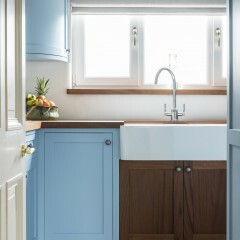 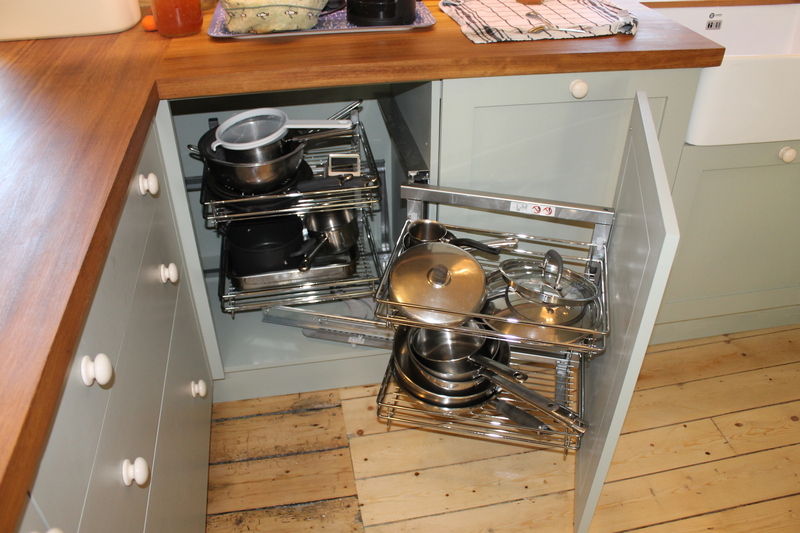 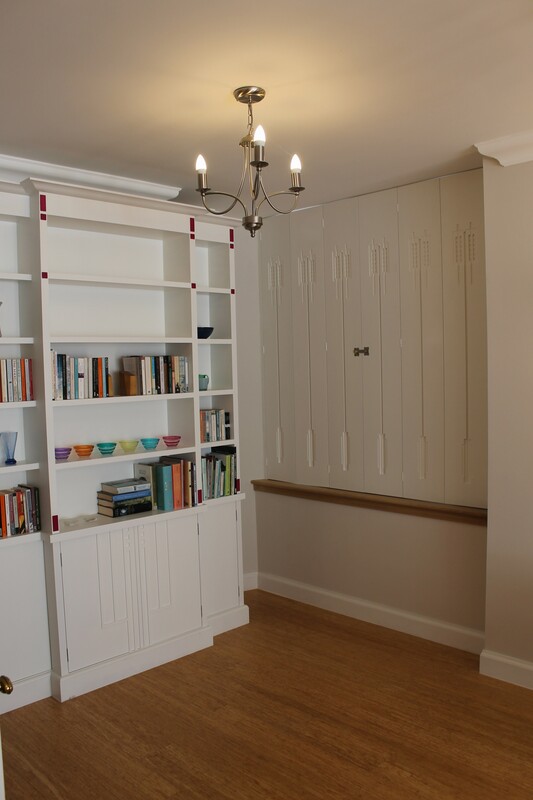 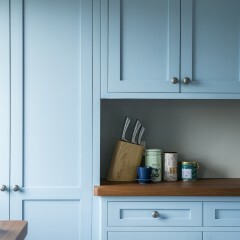 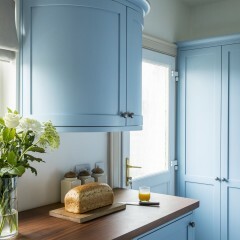 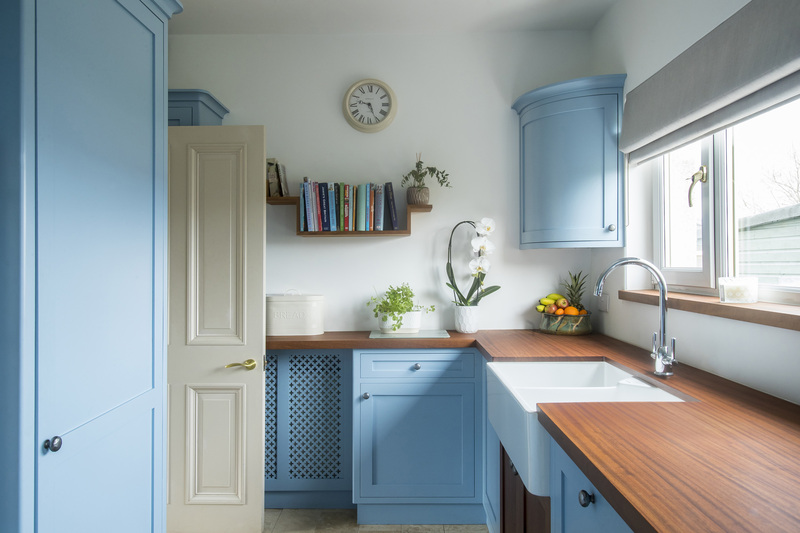 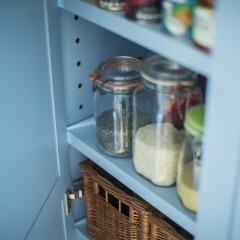 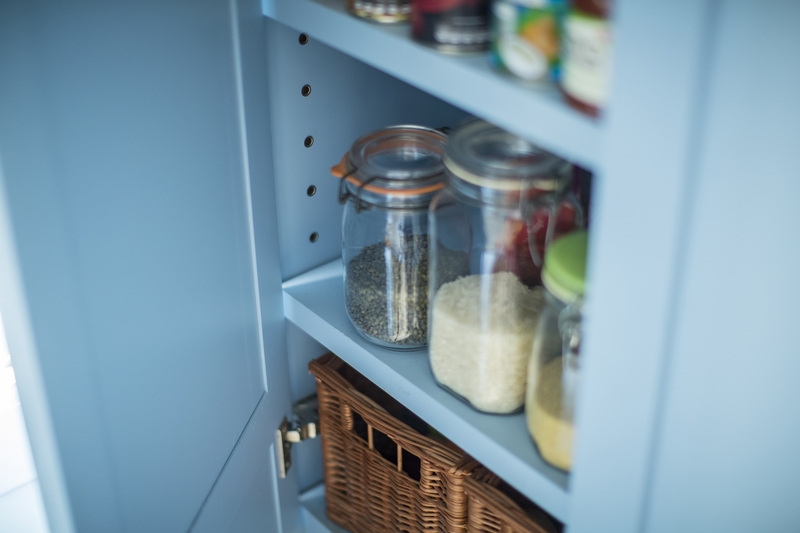 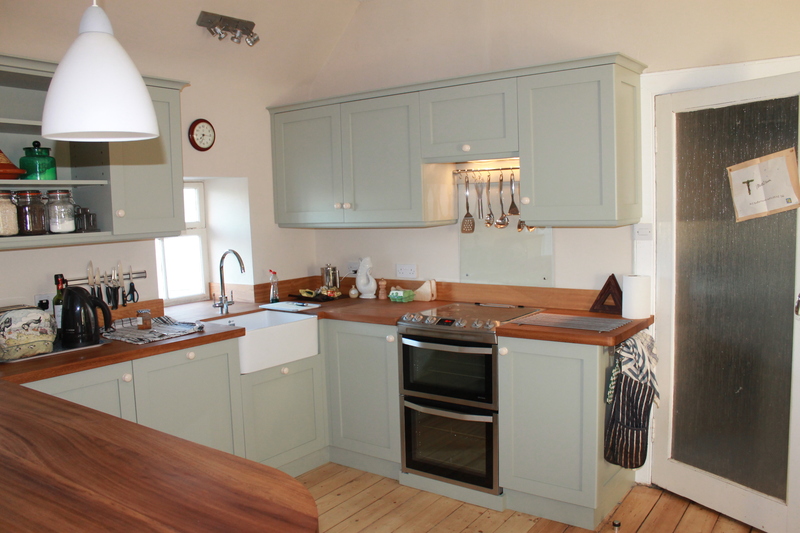 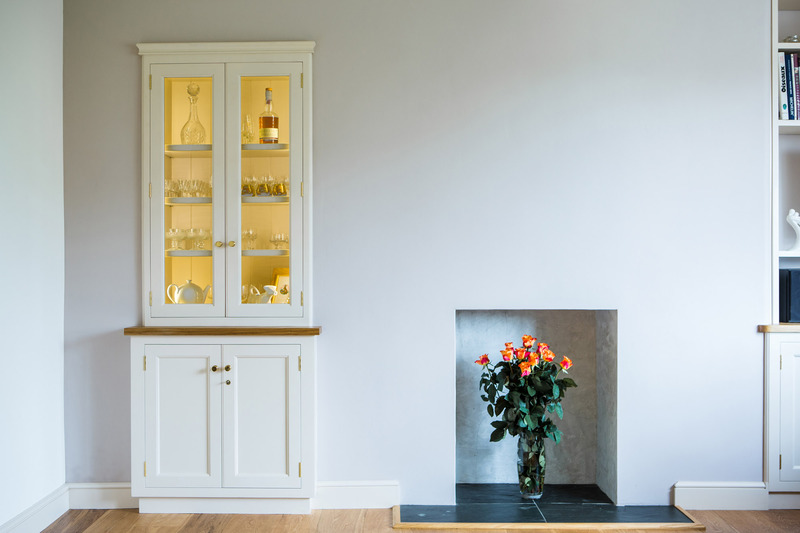 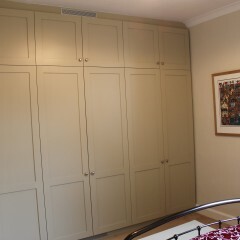 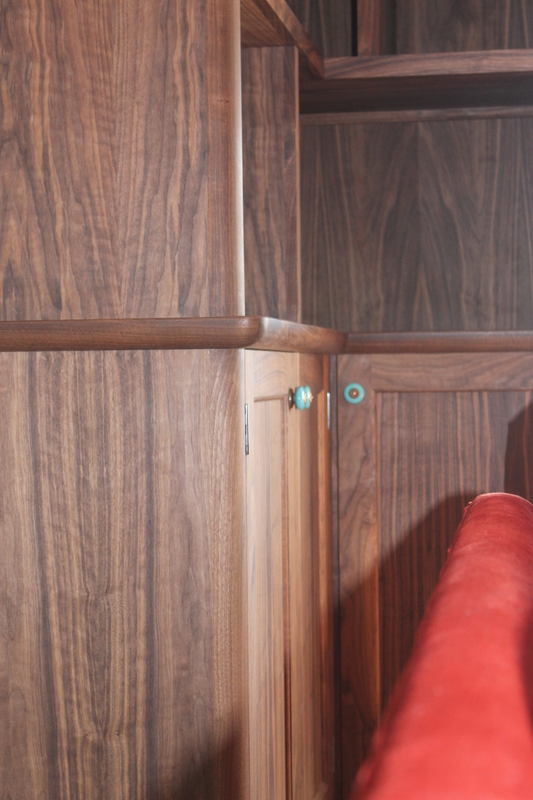 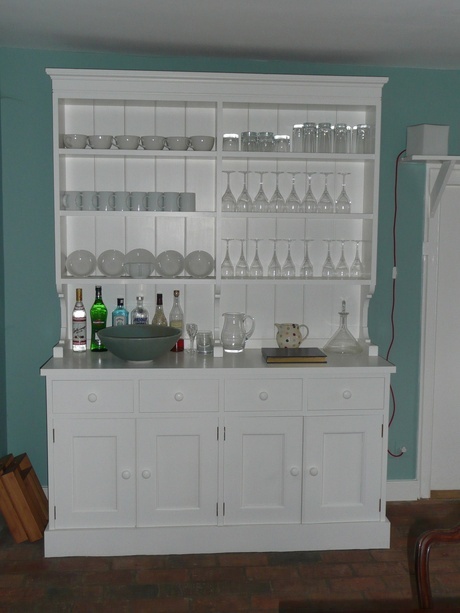 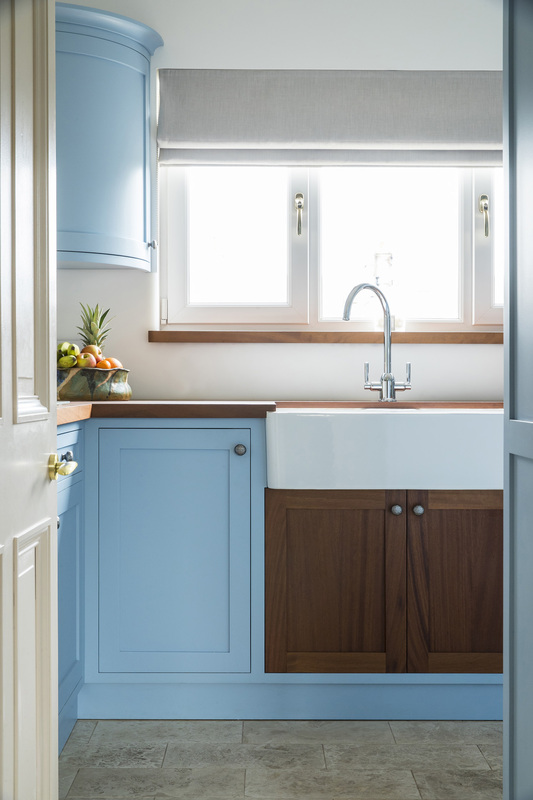 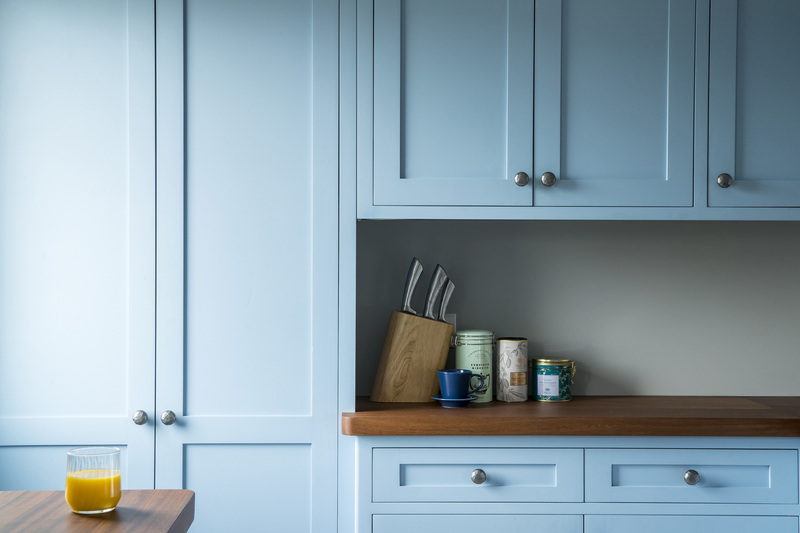 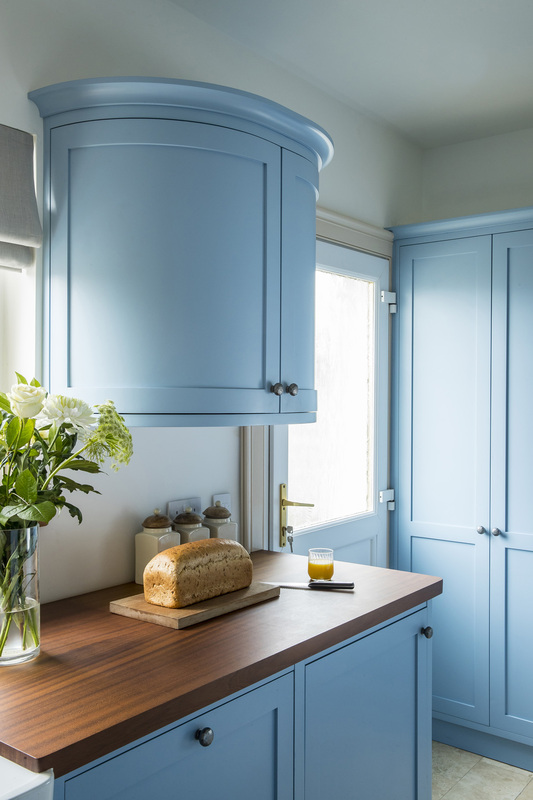 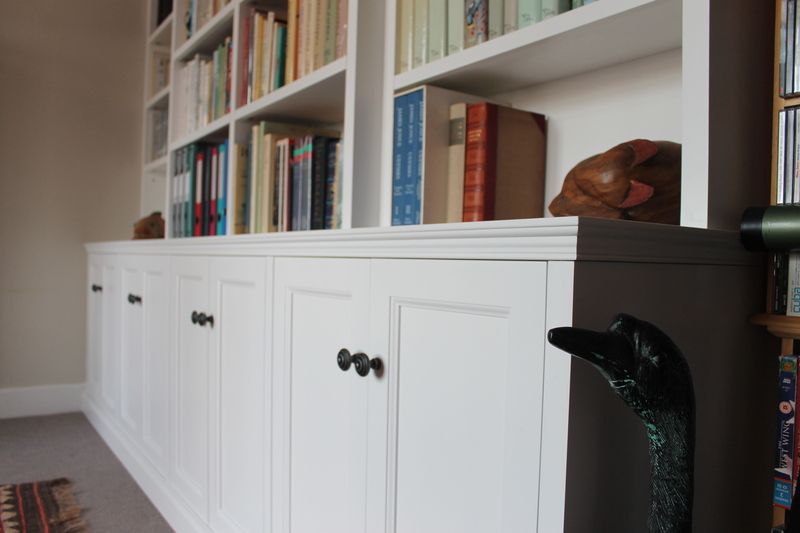 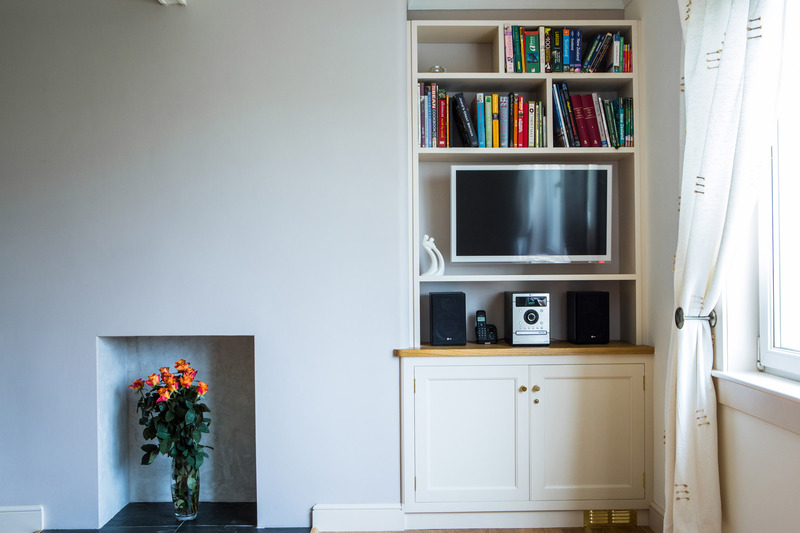 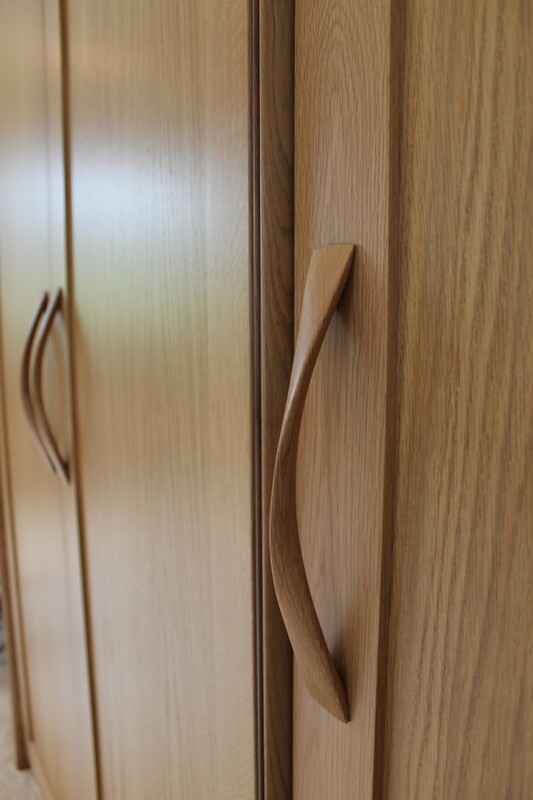 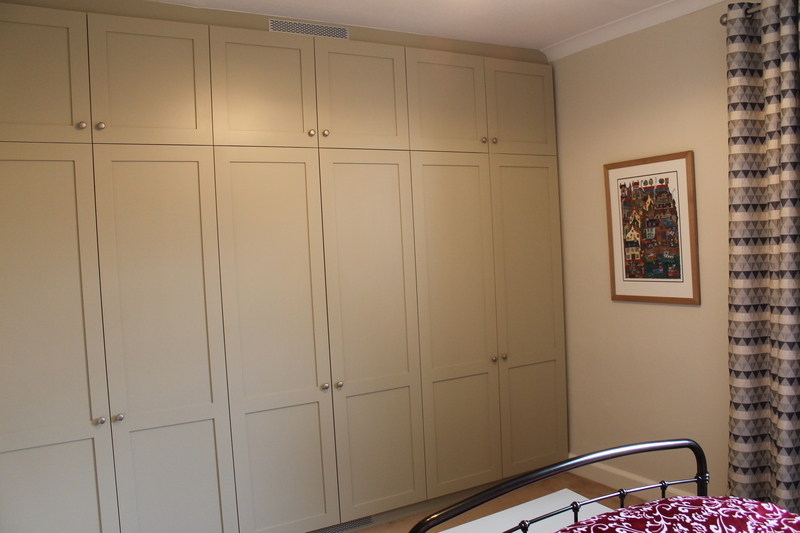 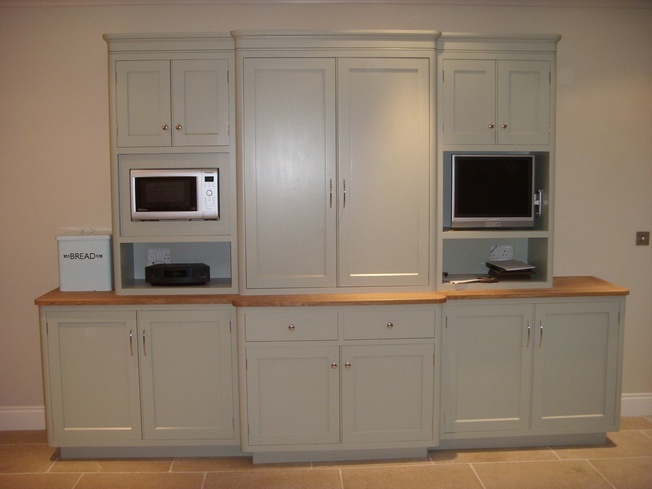 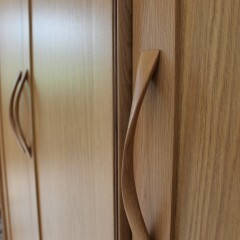 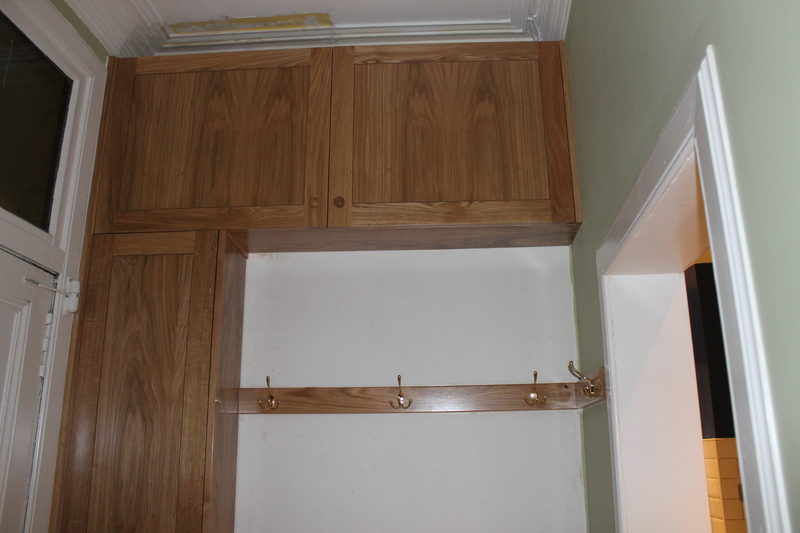 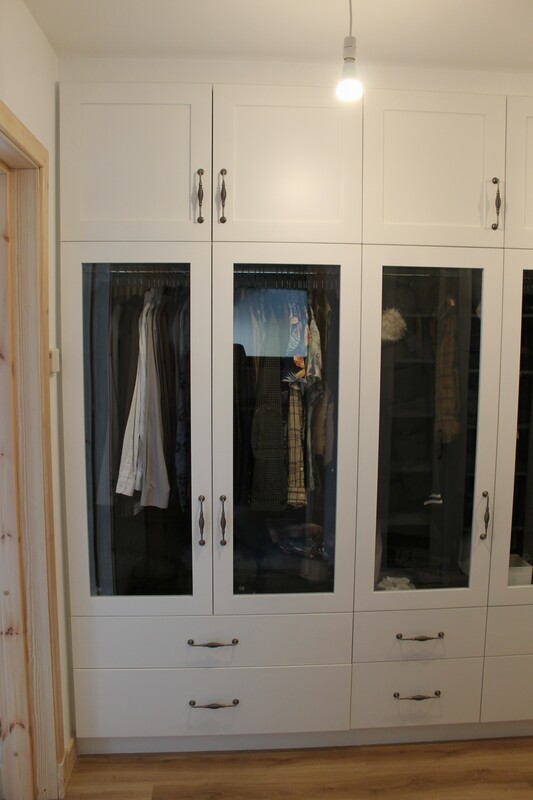 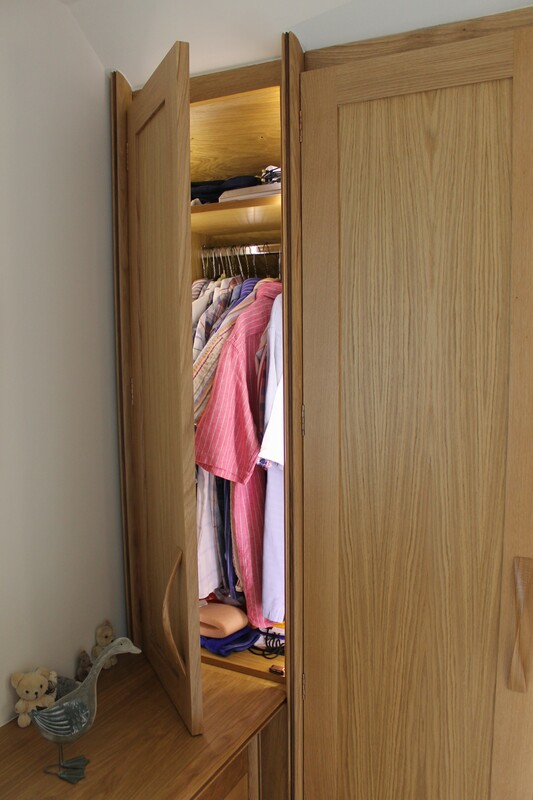 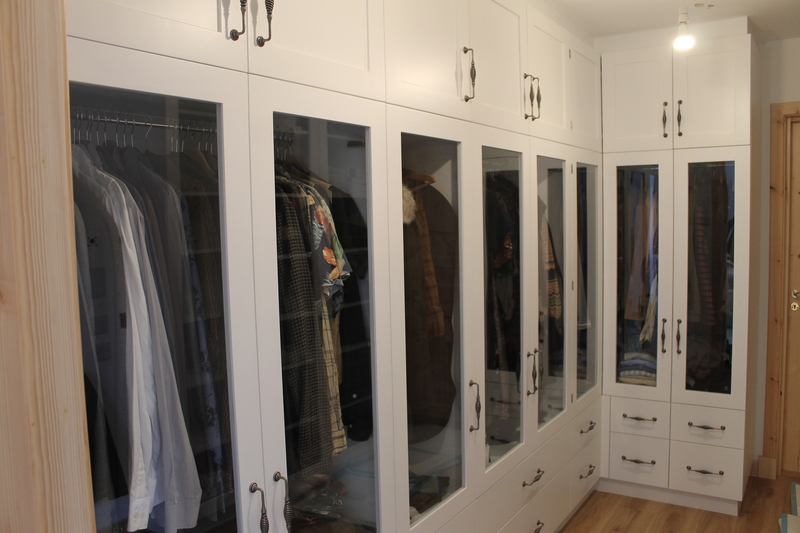 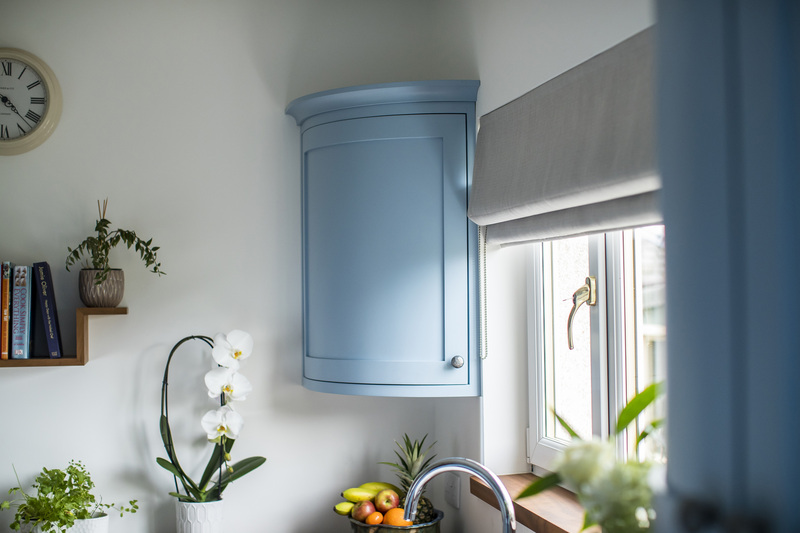 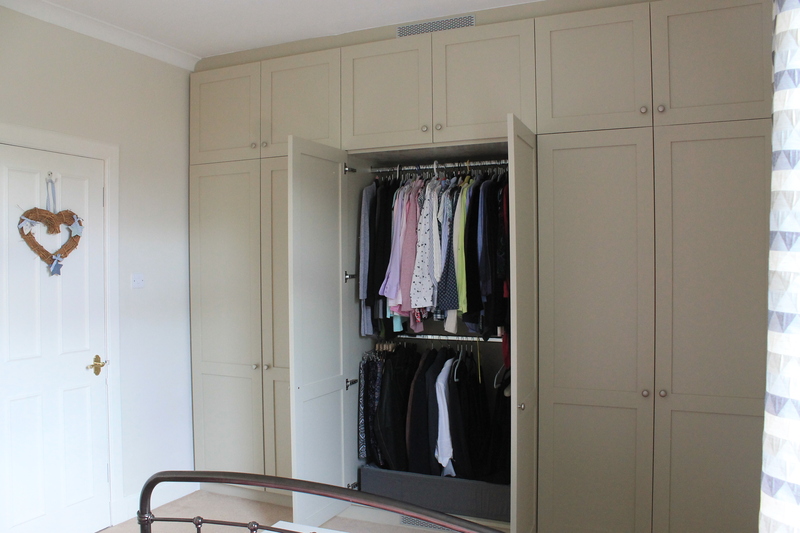 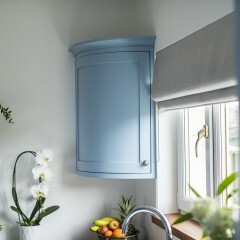 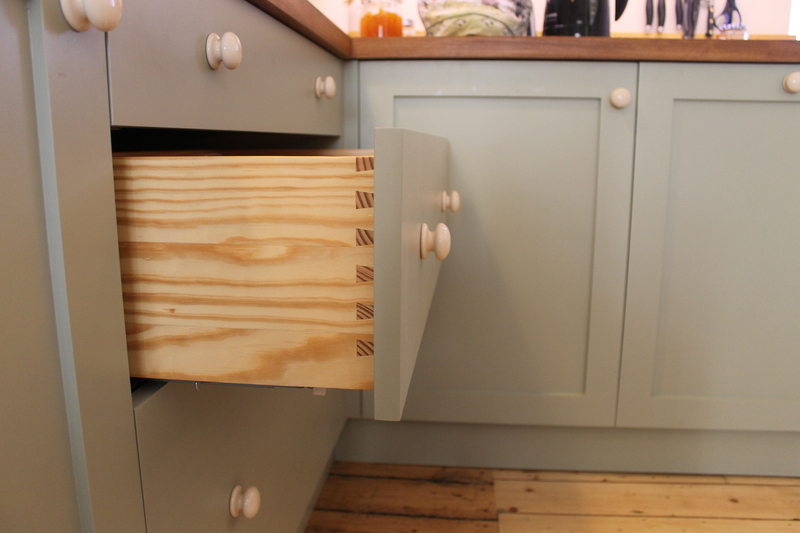 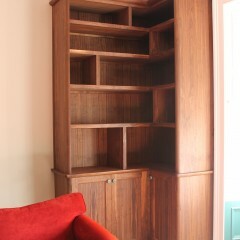 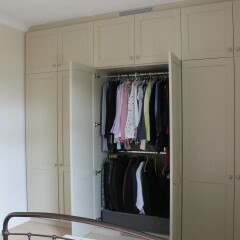 Give yours a new lease of life with roomy solid wood cabinets, stylish panelling and elegant fittings. 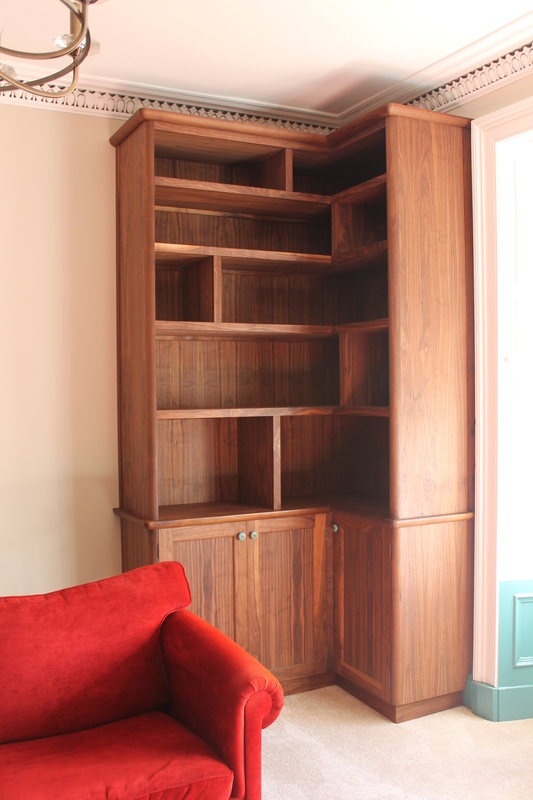 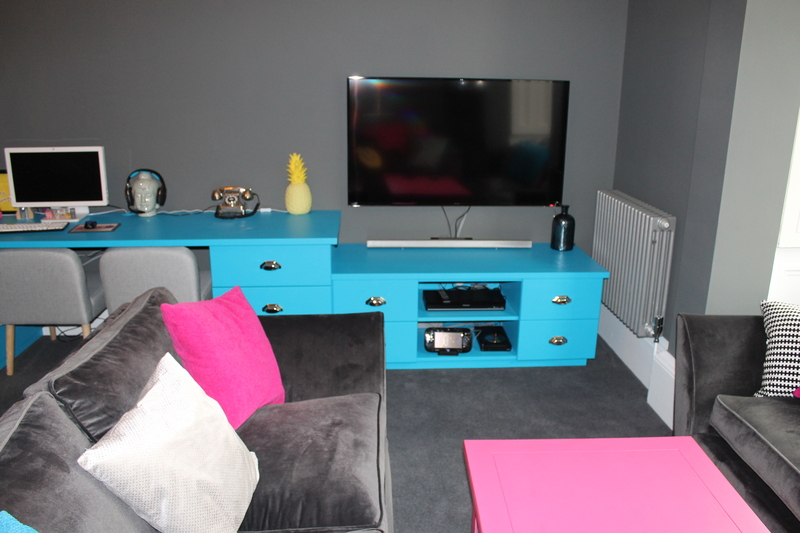 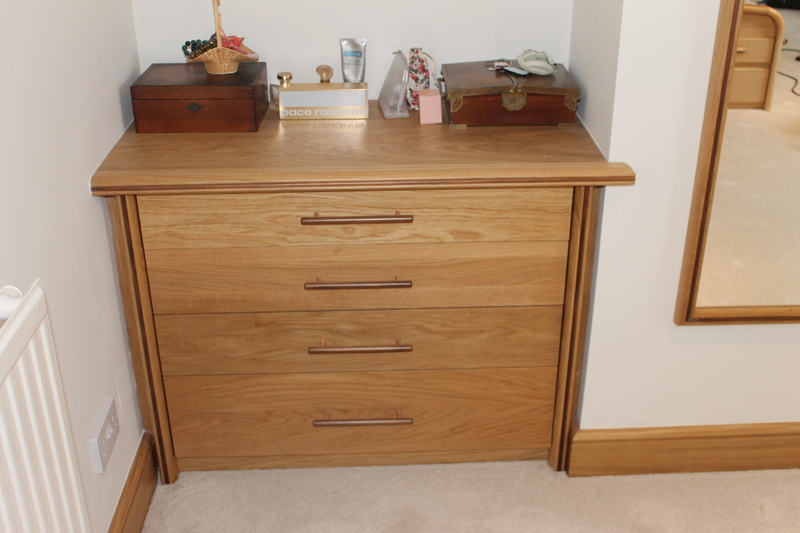 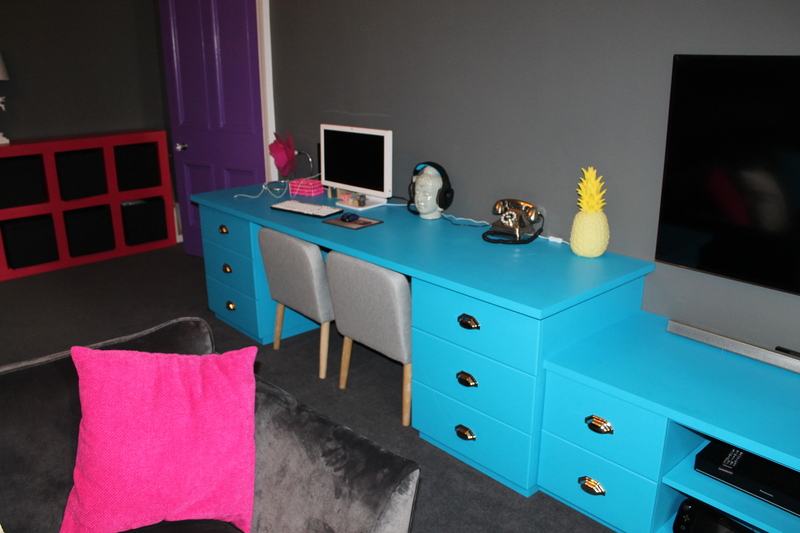 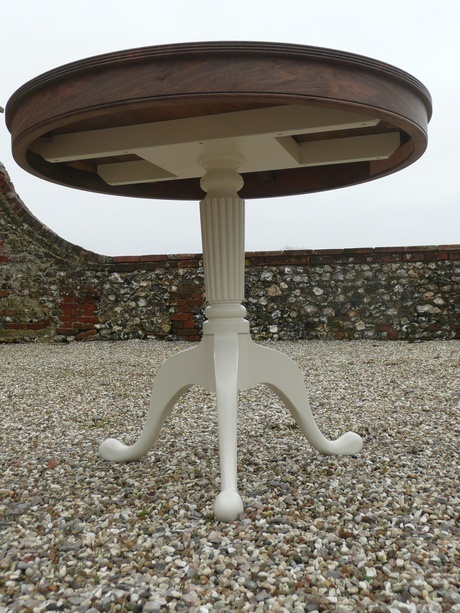 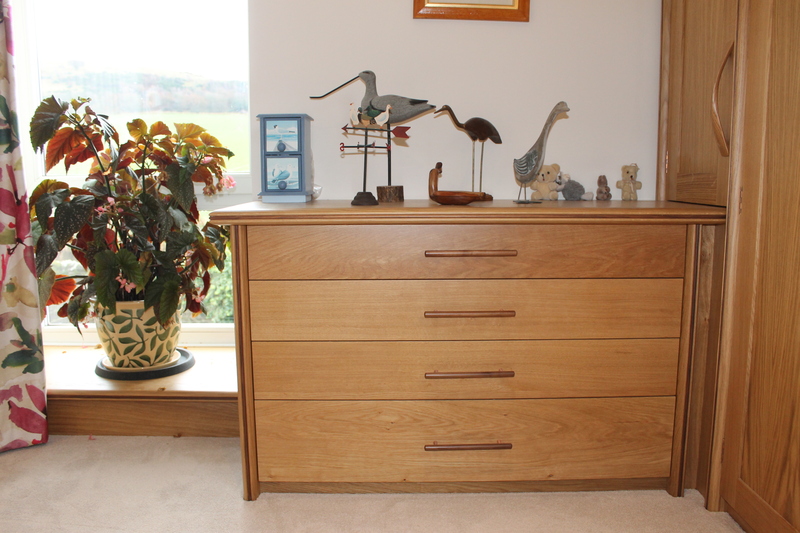 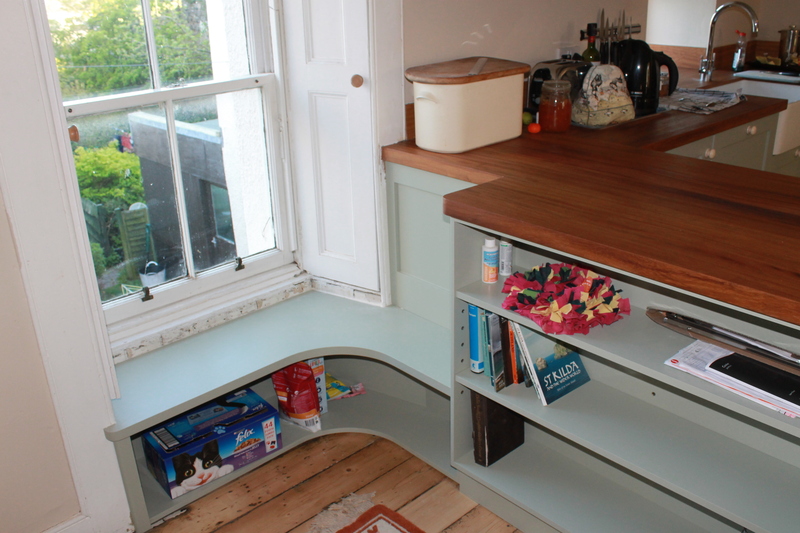 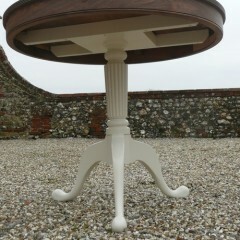 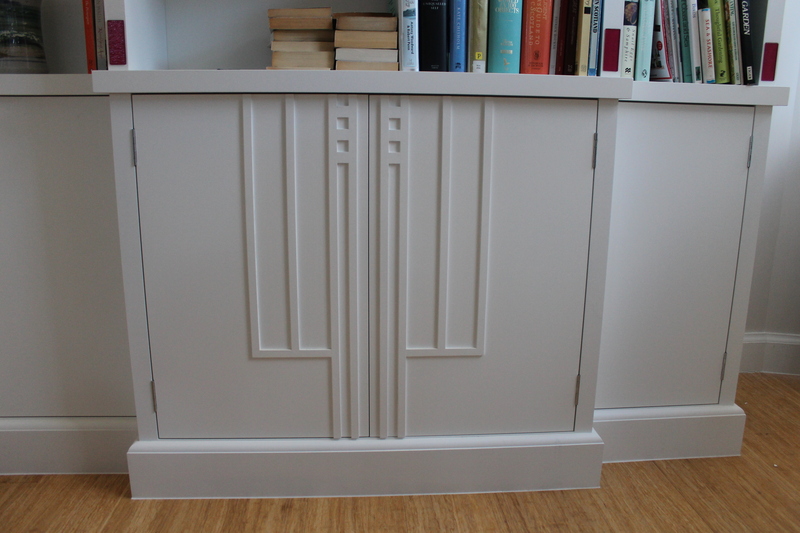 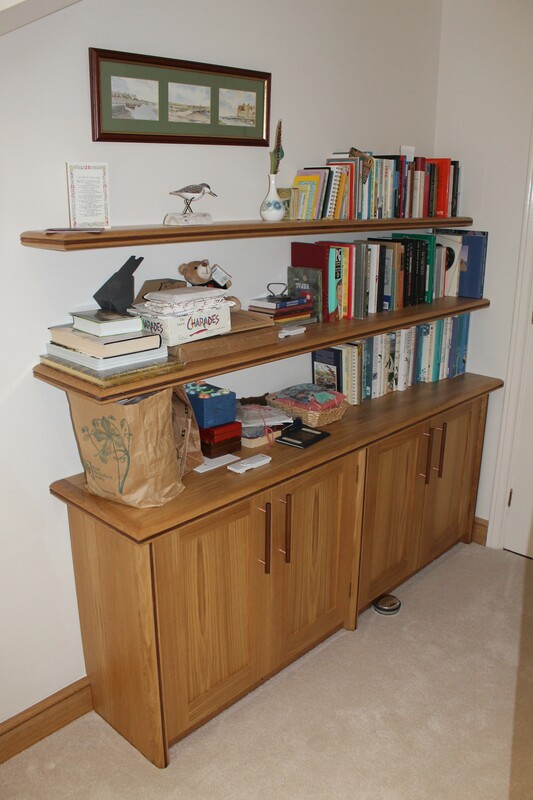 Do you have an old or much-loved piece of furniture that needs restored to its former glory? 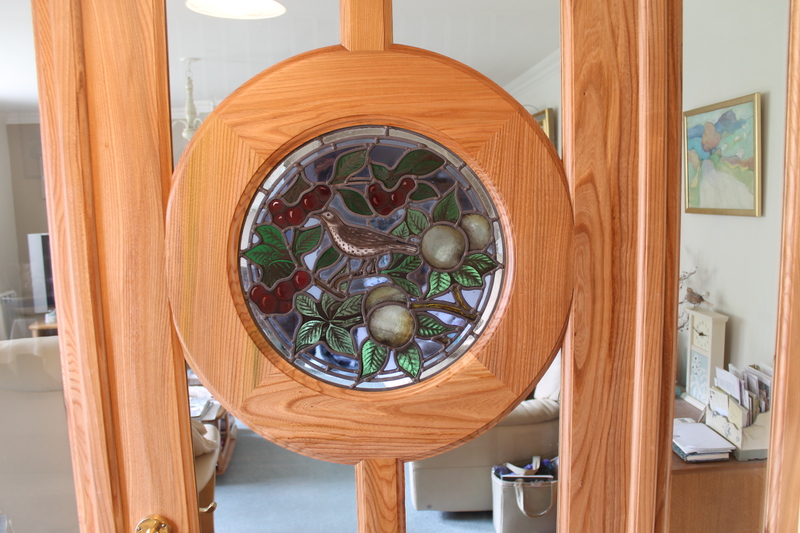 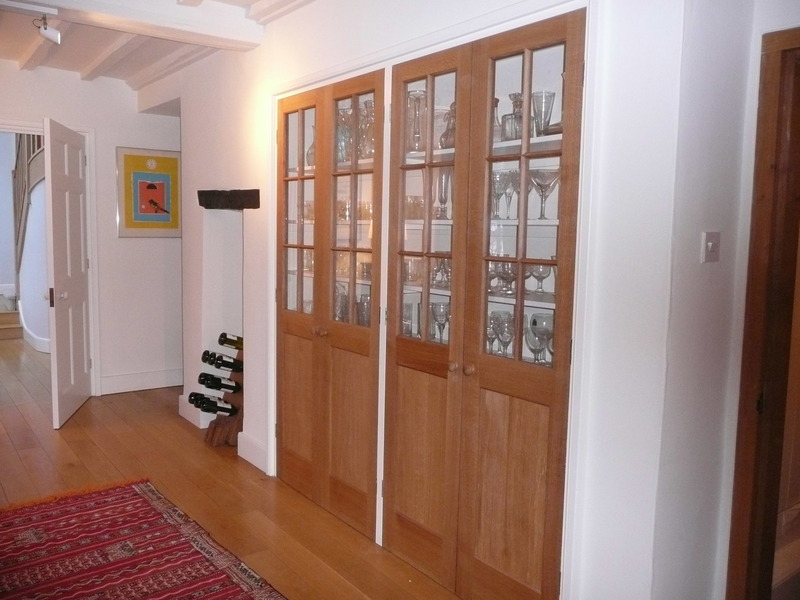 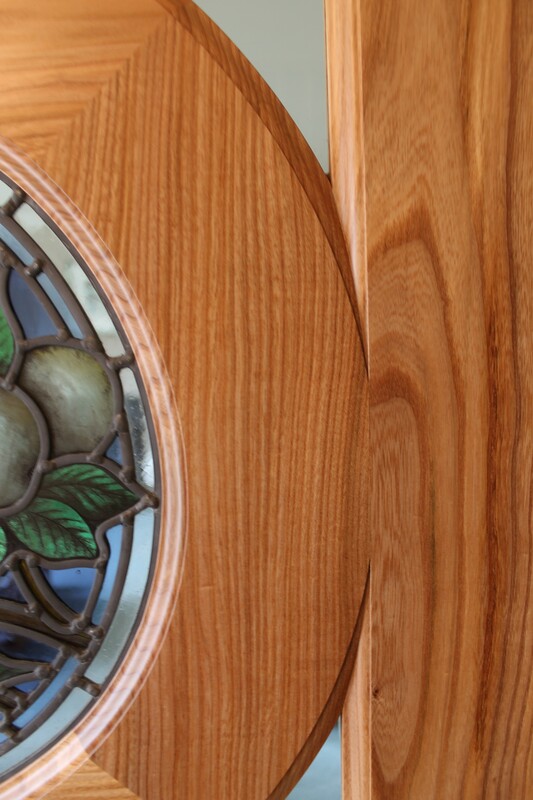 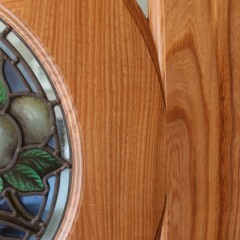 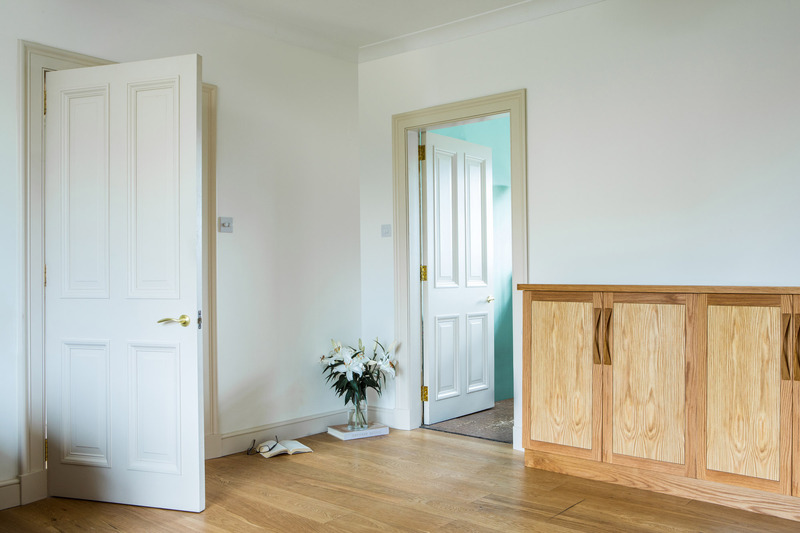 Maybe a door, a fixture or fitting in your home needs to be modified or repaired to match other traditional panelling or woodwork? 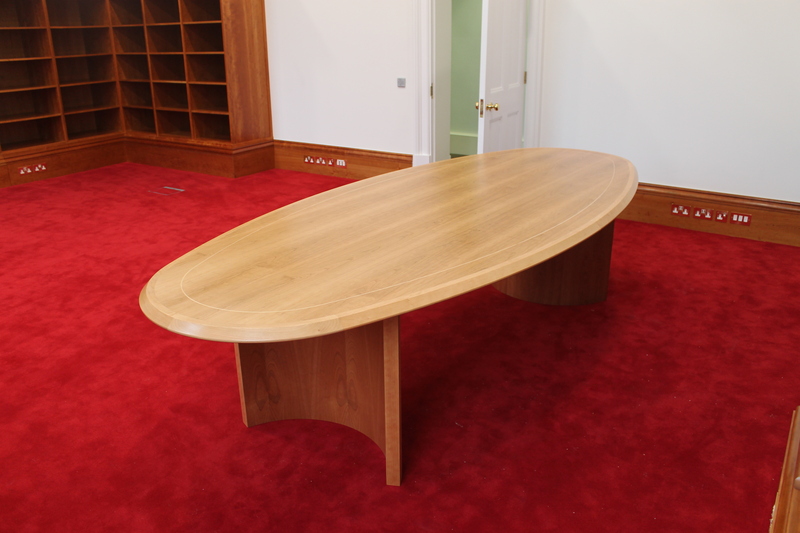 We recently took a piece of marble and built it into a magnificent wooden coffee table – so we’re always open to suggestions! 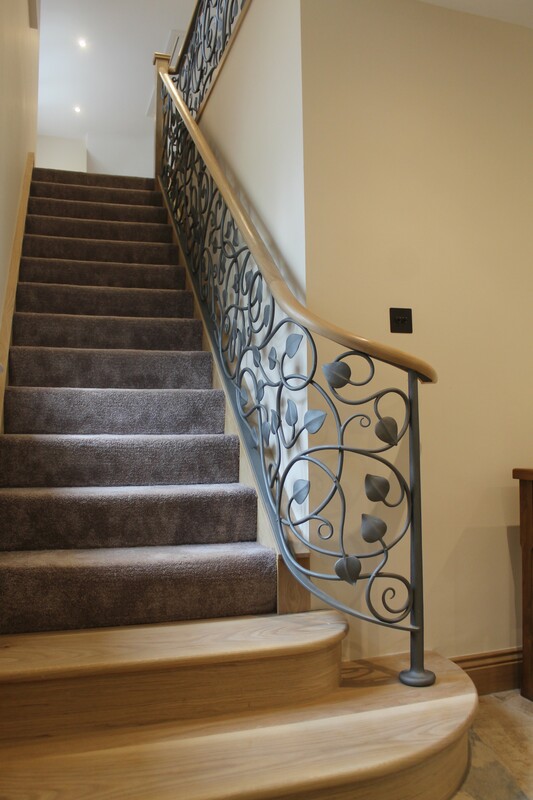 I wouldn't hesitate to recommend you, you've been such a pleasure to work with from start to finish and have brought exactly what I had in my head to life. 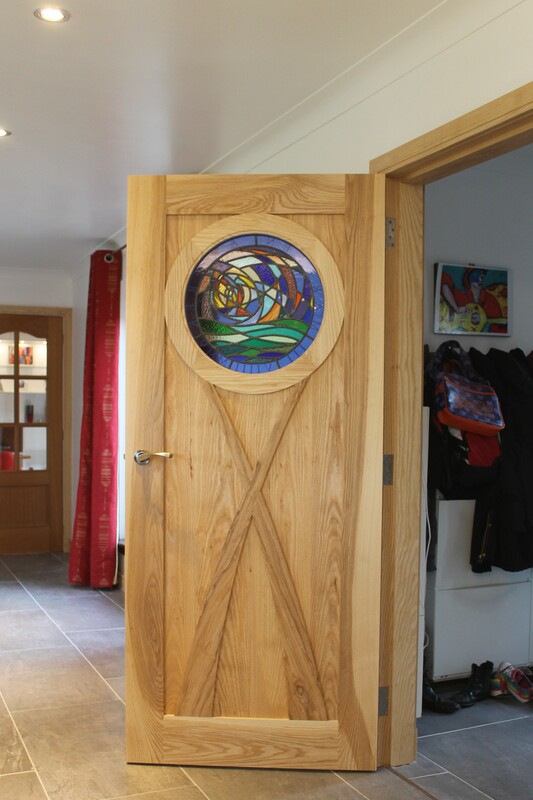 I wouldn’t hesitate to recommend you, you’ve been such a pleasure to work with from start to finish and have brought exactly what I had in my head to life. 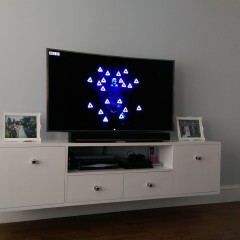 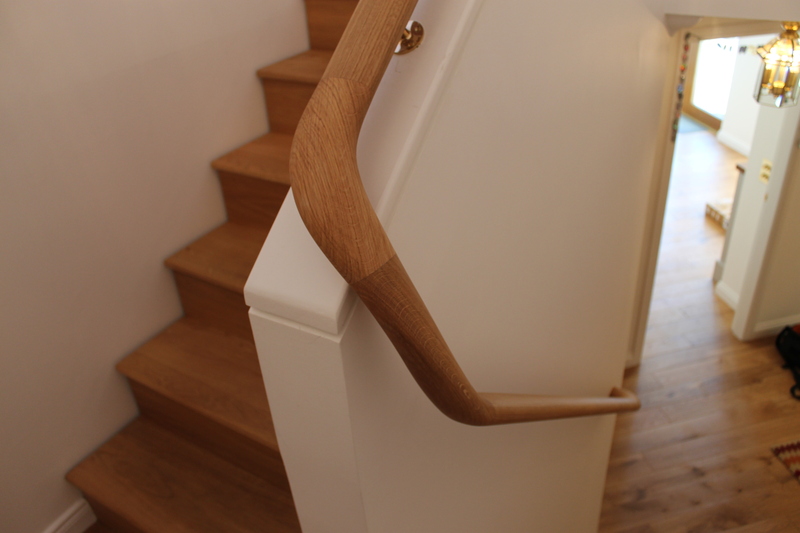 Fantastic job, Florent! 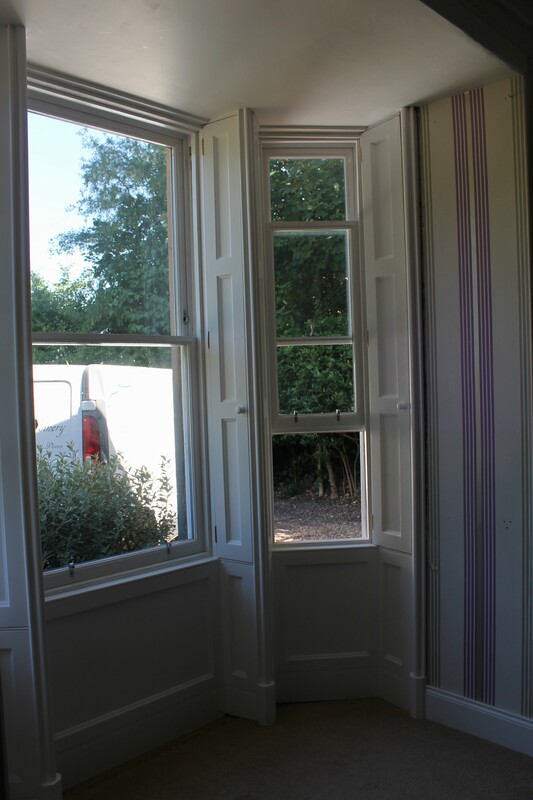 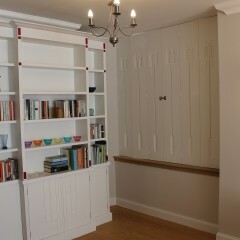 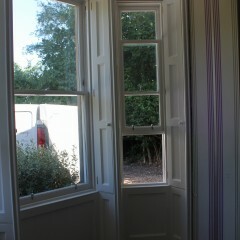 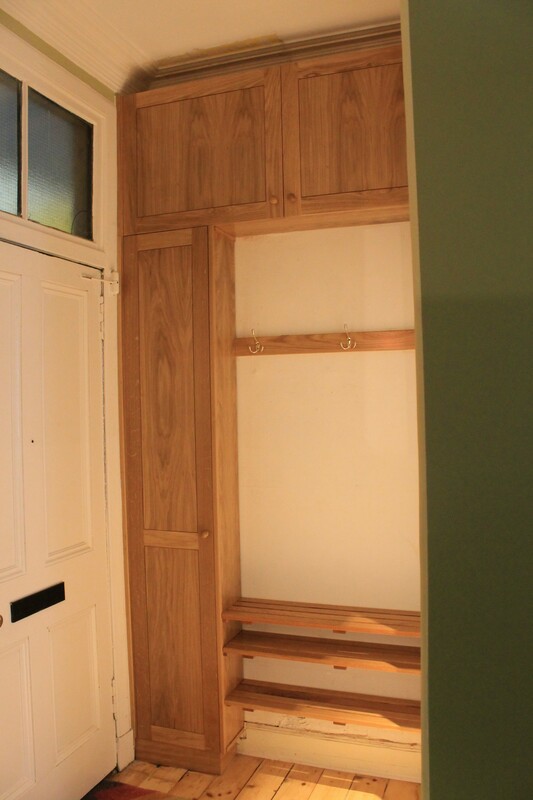 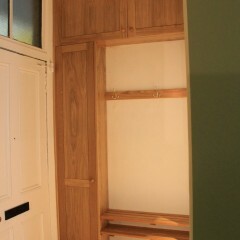 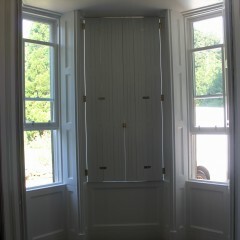 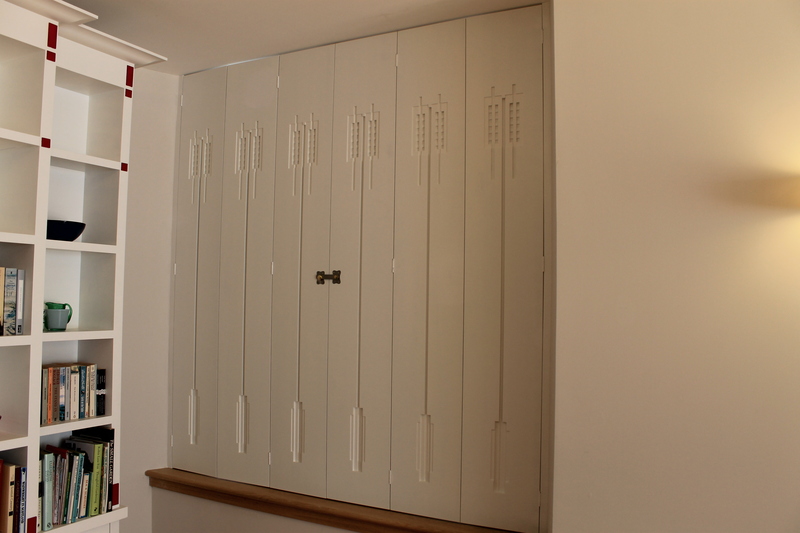 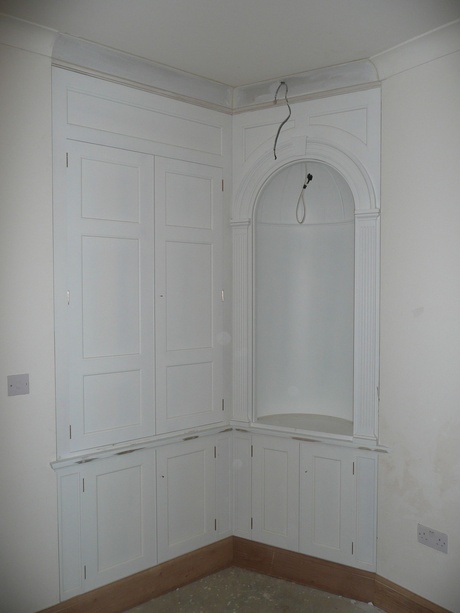 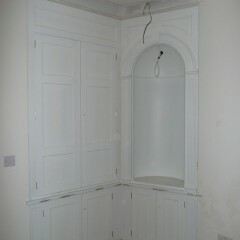 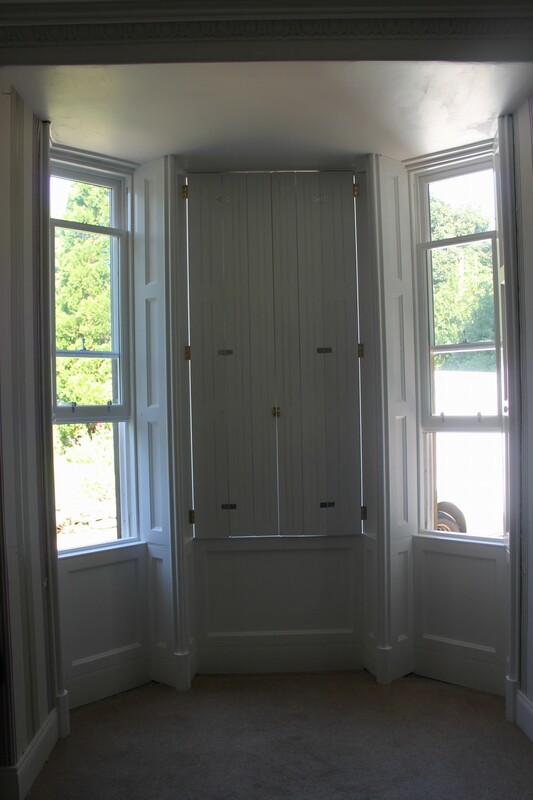 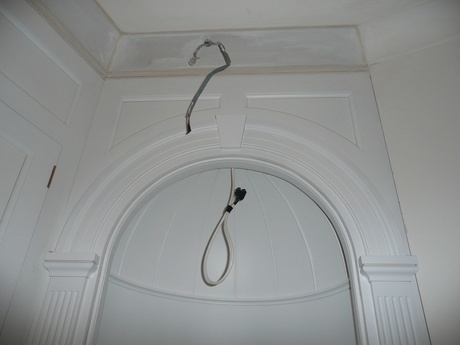 This was a bespoke panelled door for our Victorian internal shower room to match existing panels in the other doors. 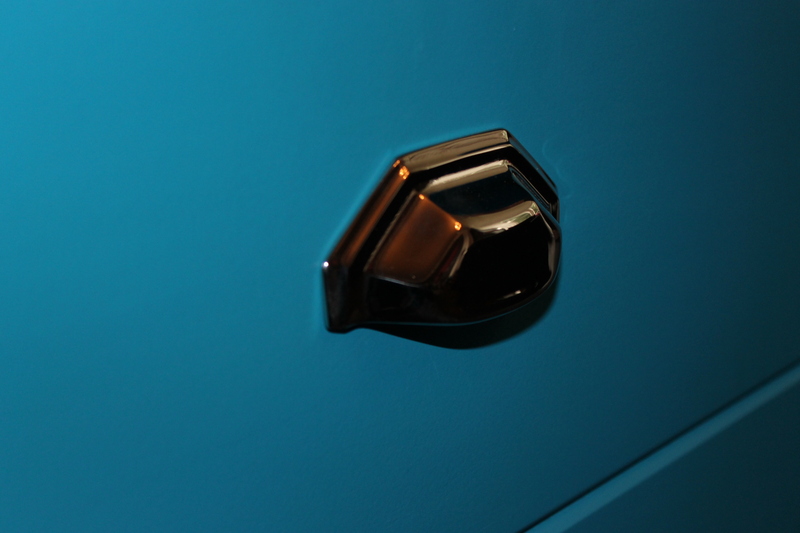 The scaled-down version with opaque glass lets others know when ‘WC occupé’! 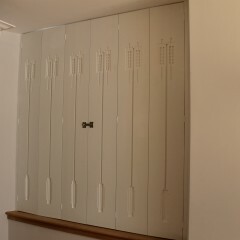 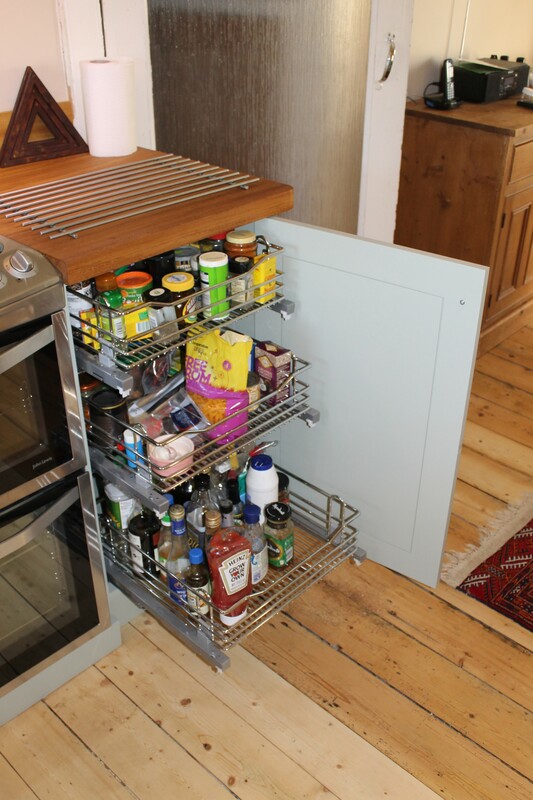 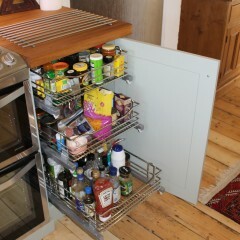 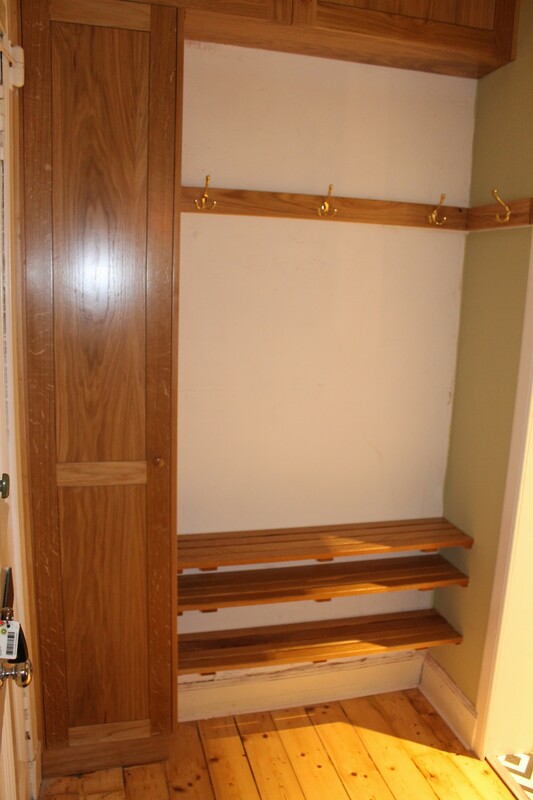 And the additional hinged doors on the under-stairs cupboard has made it much easier for us to access those ‘once a year’ items. 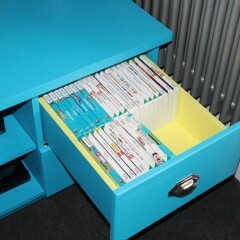 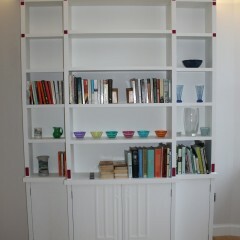 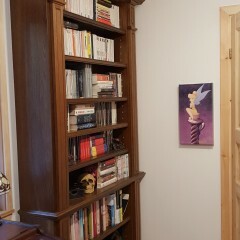 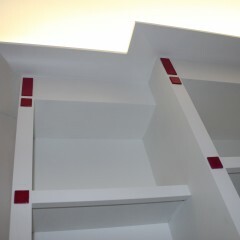 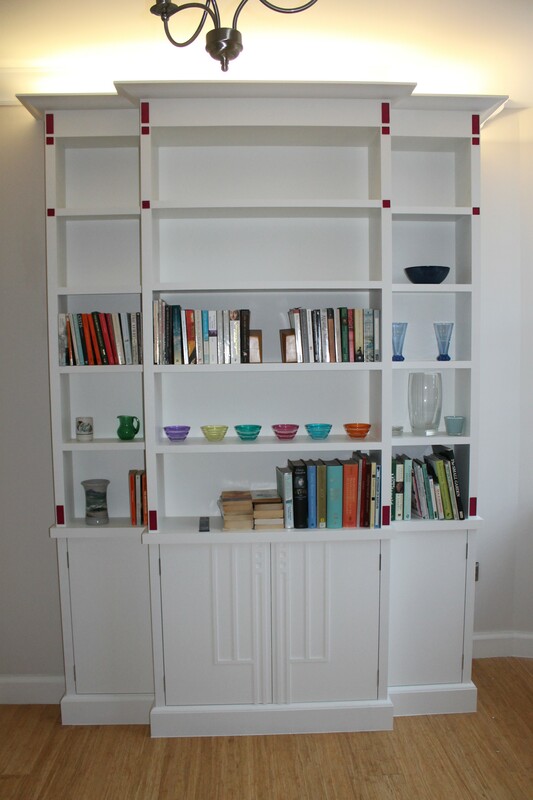 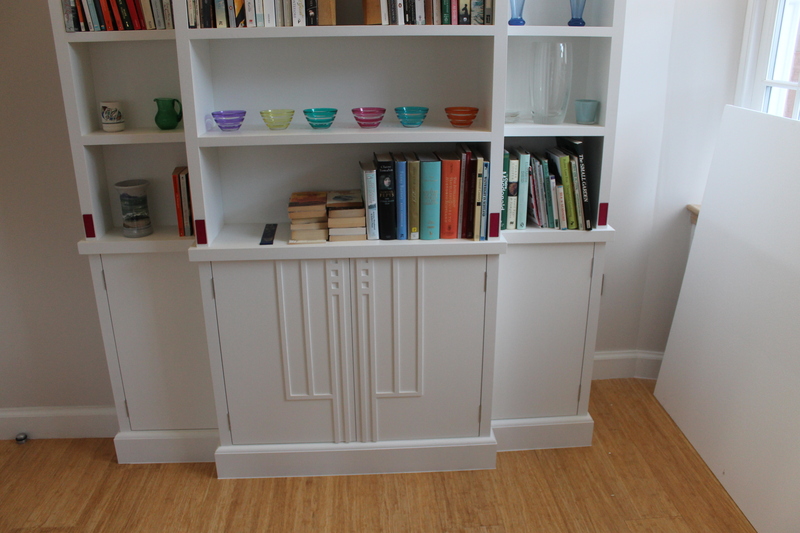 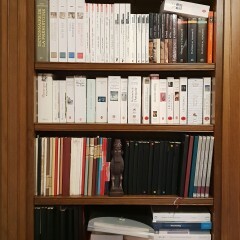 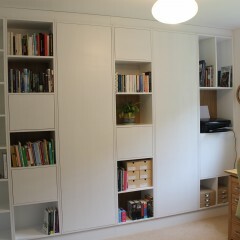 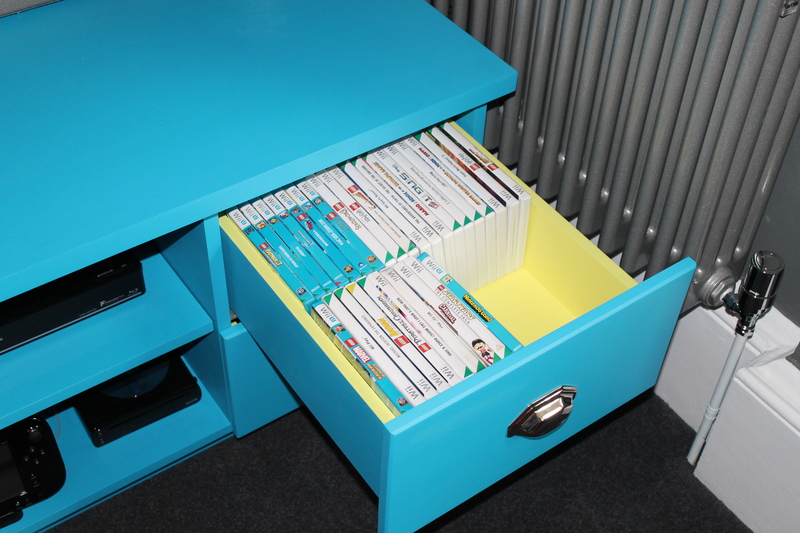 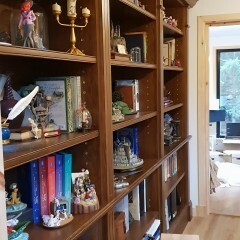 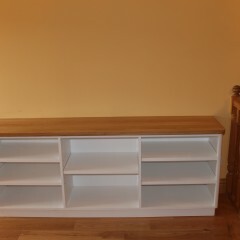 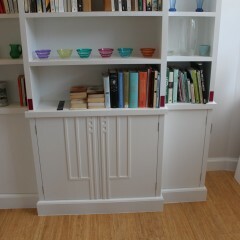 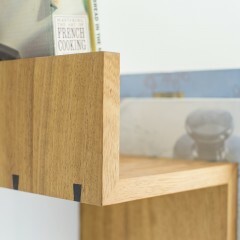 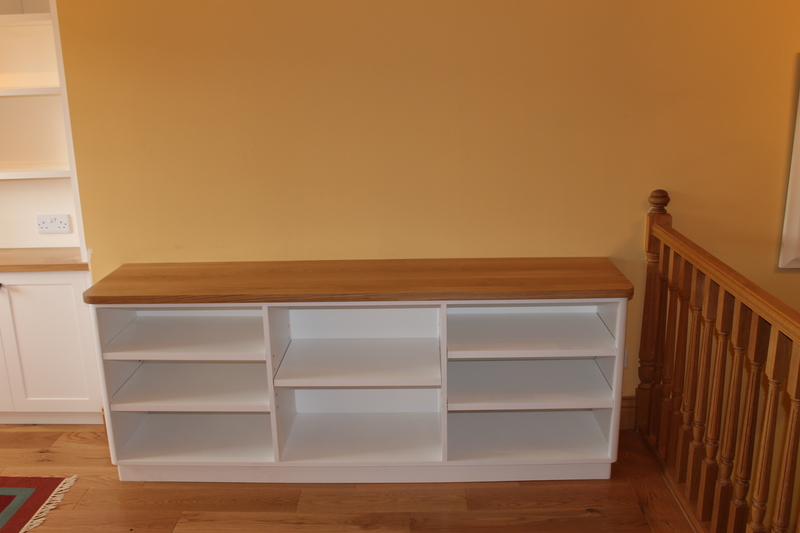 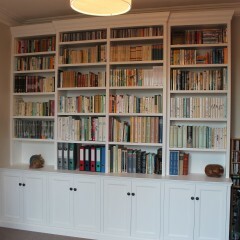 Many thanks, Florent, for doing a great job making my library bookcases. 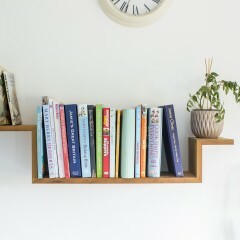 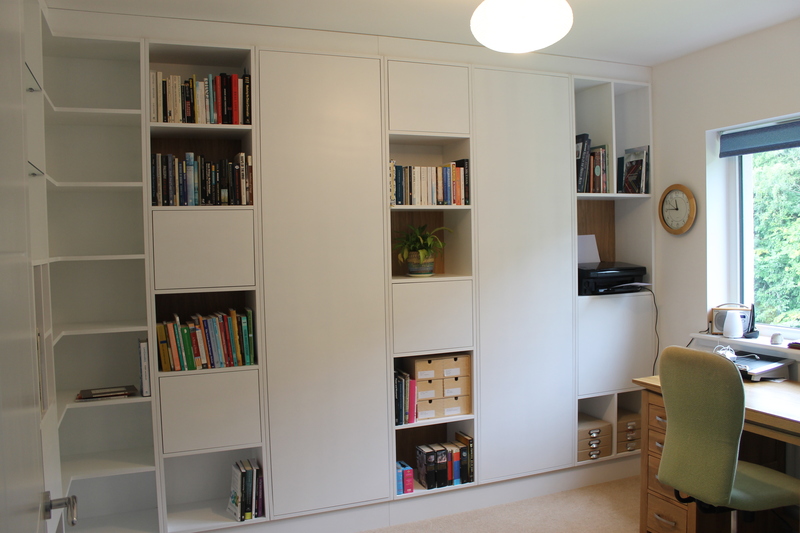 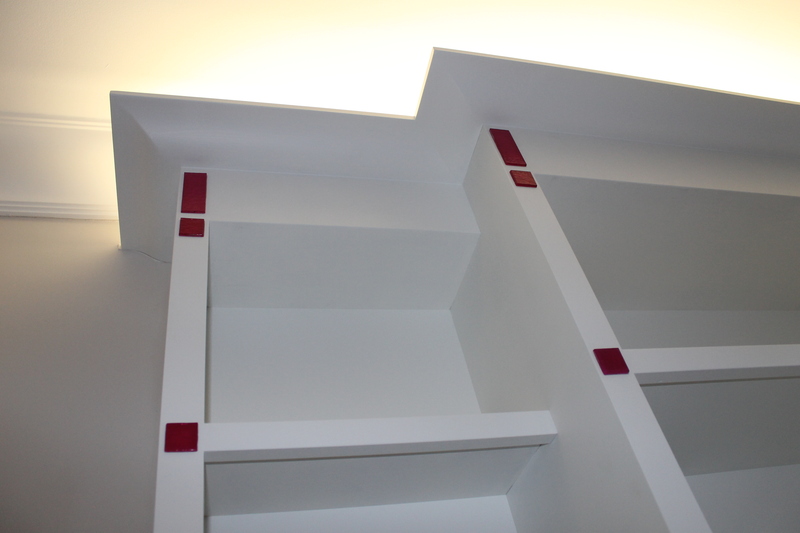 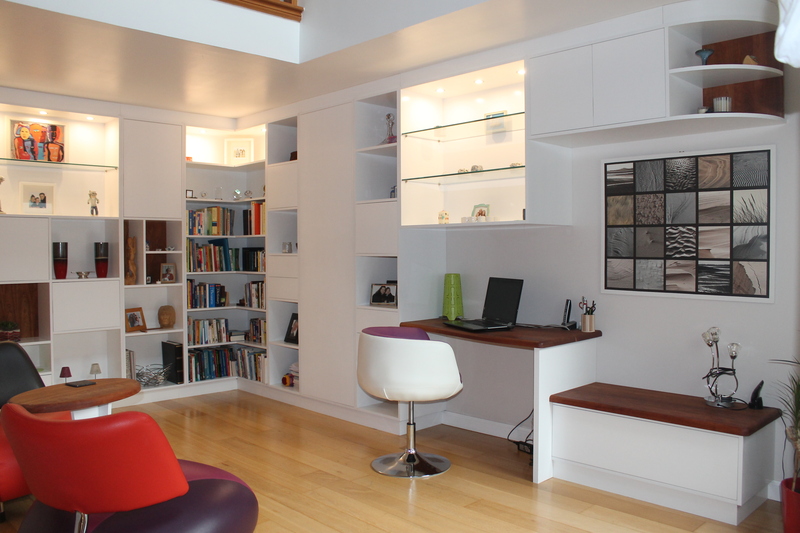 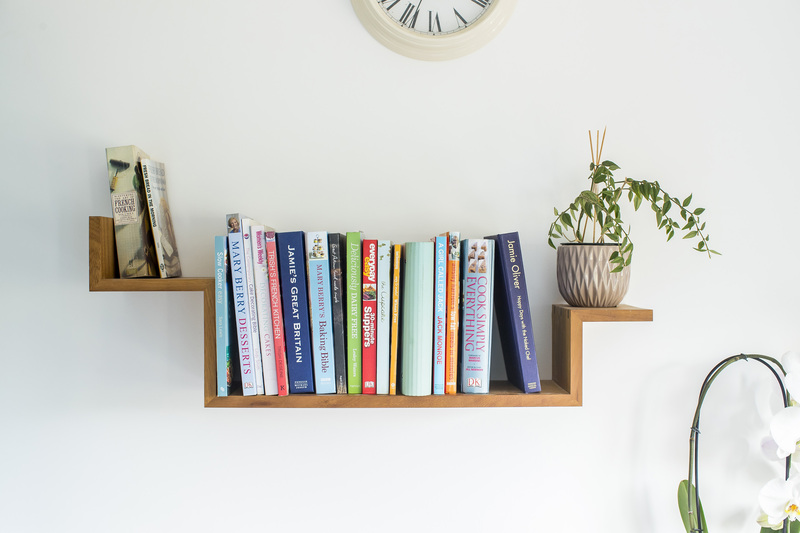 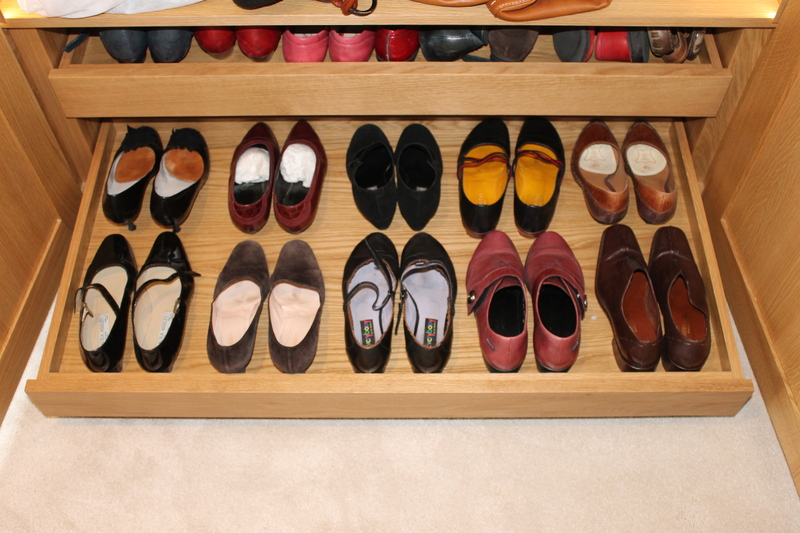 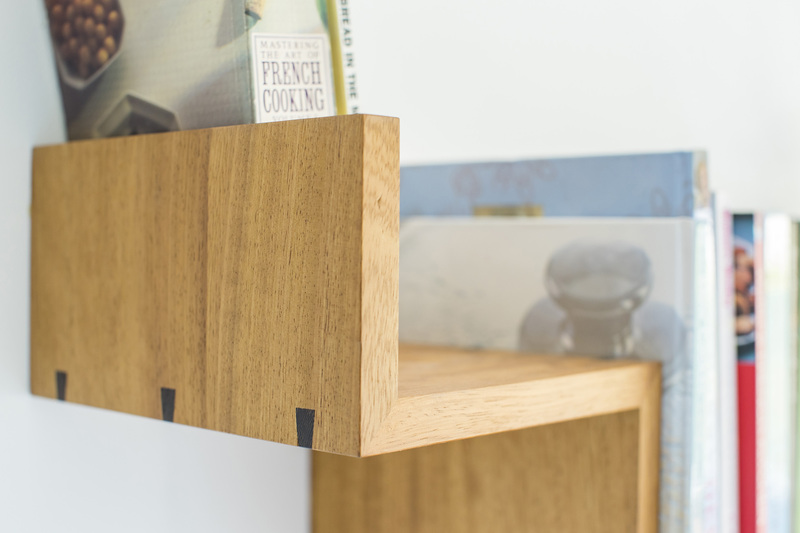 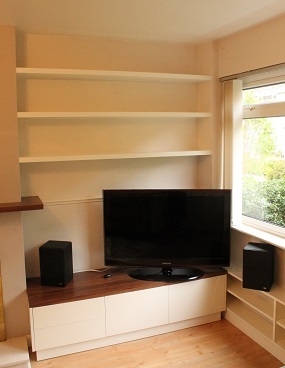 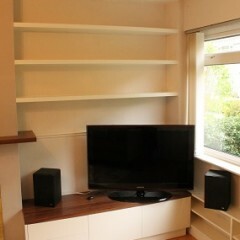 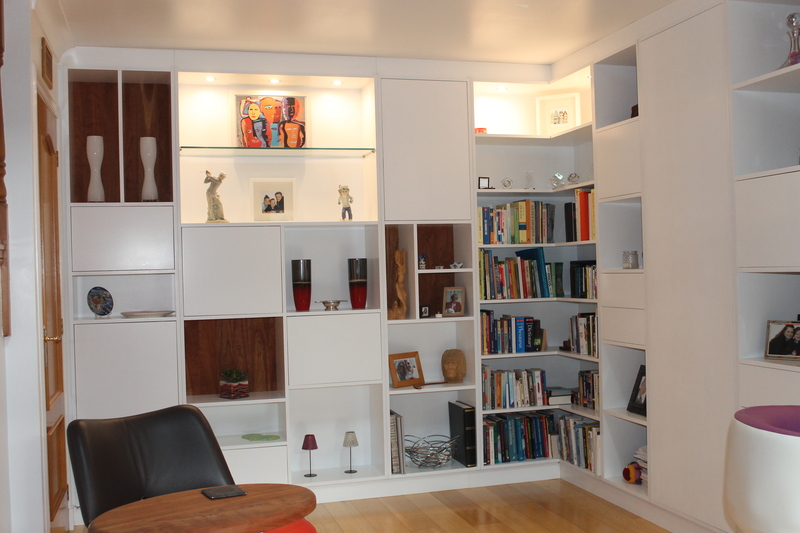 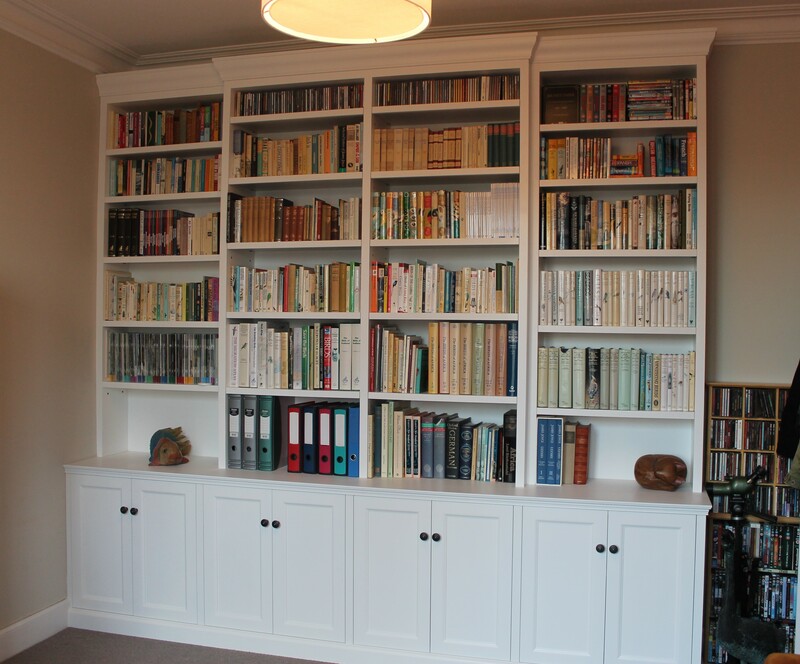 A hassle-free professional service – and the shelves look great. 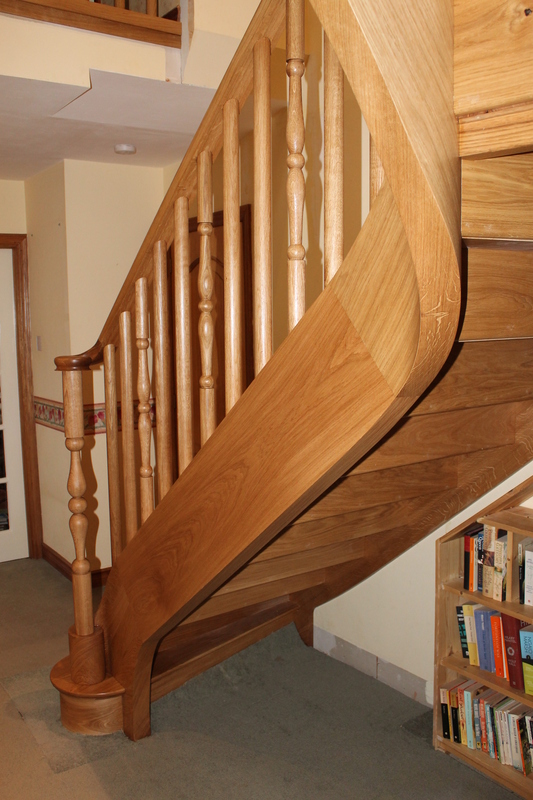 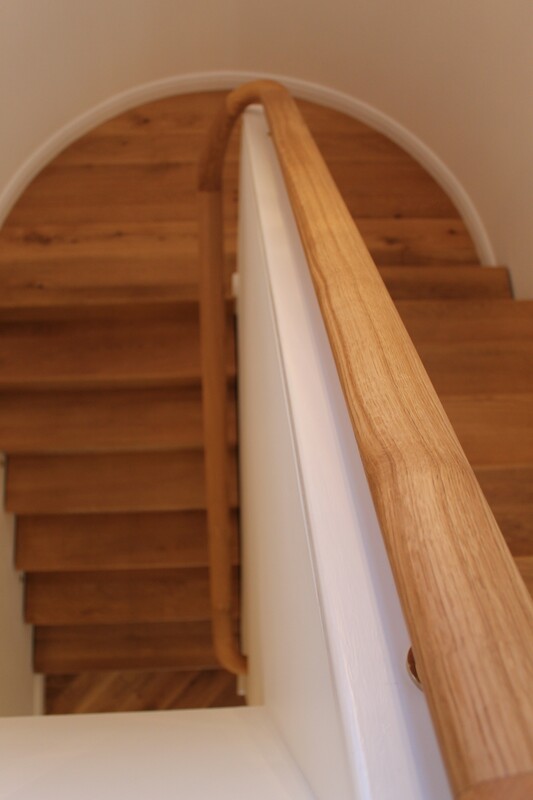 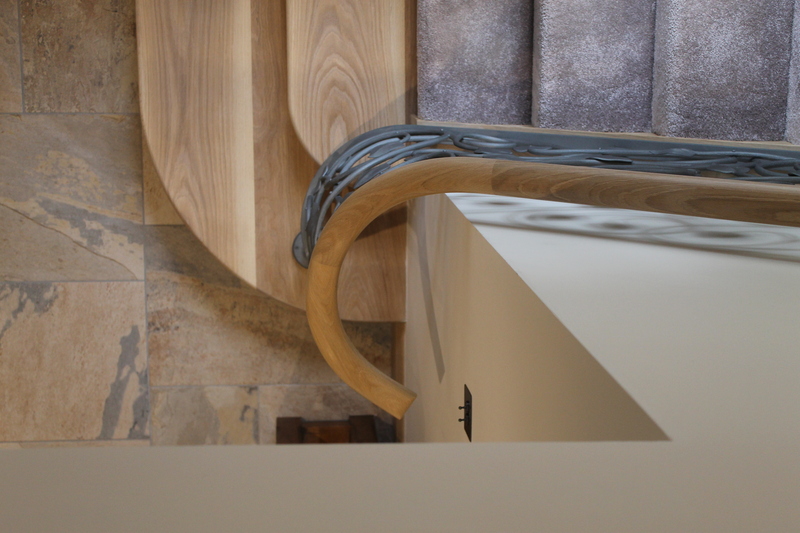 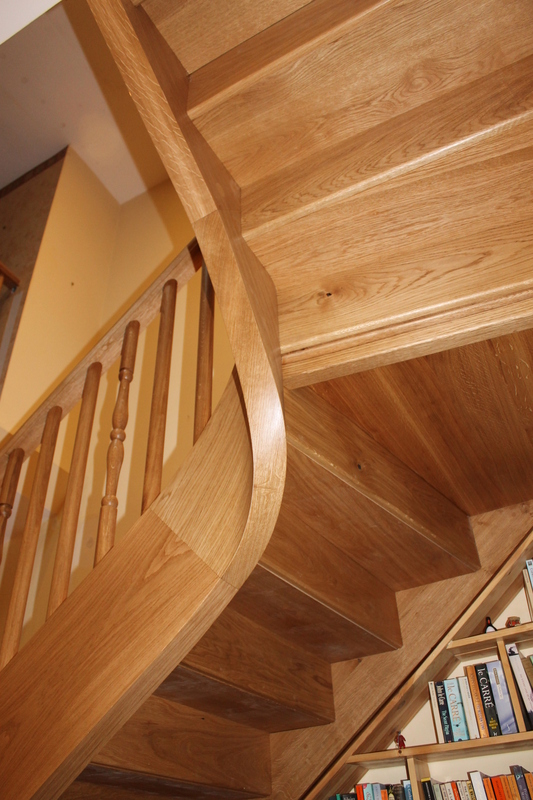 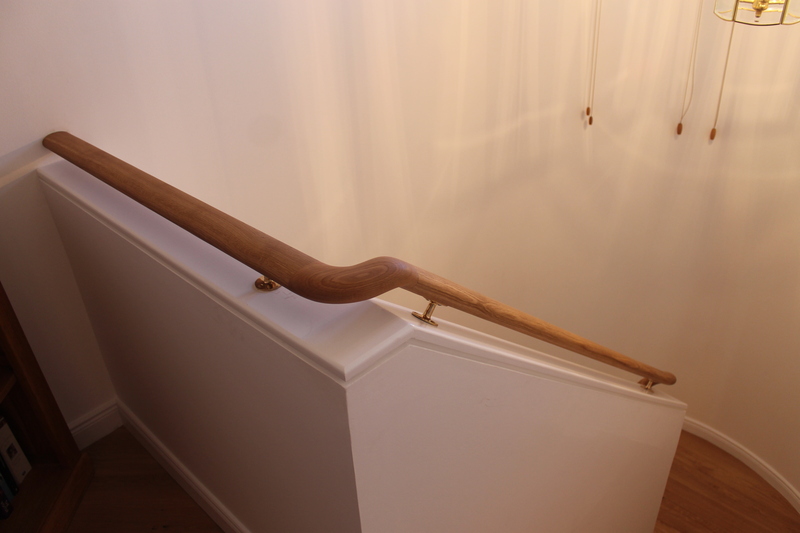 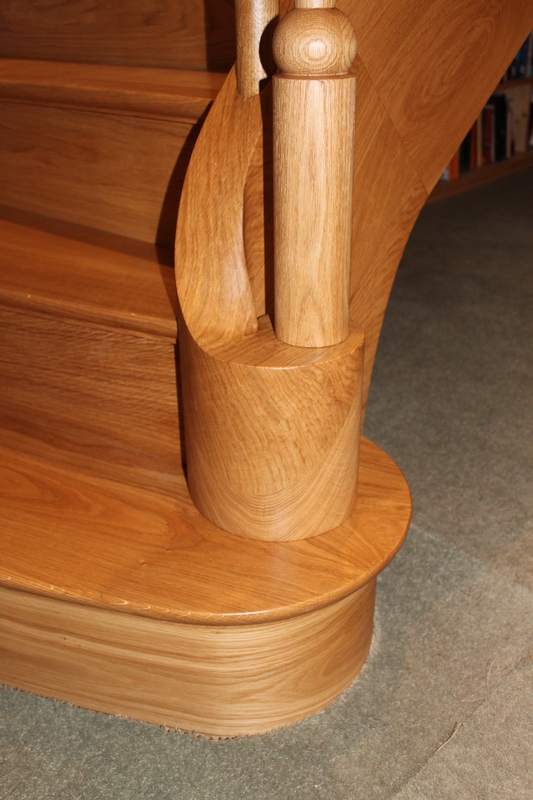 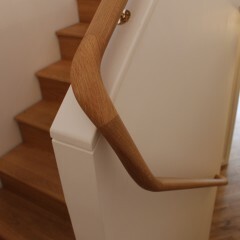 I am delighted with the excellent quality of work carried out from initial consultation and quote, through the design, manufacture and fitting of the oak banister. 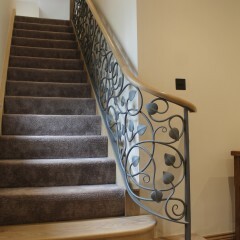 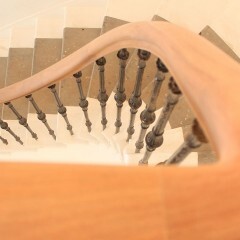 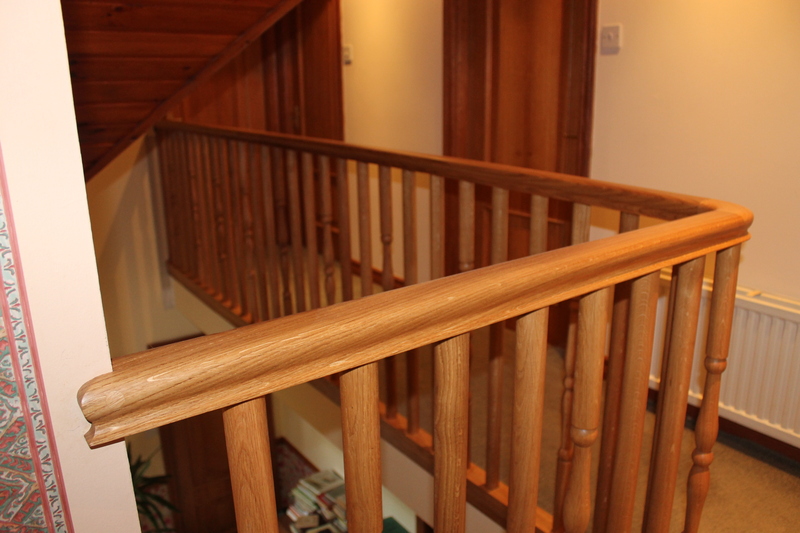 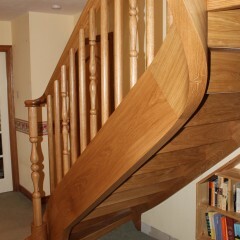 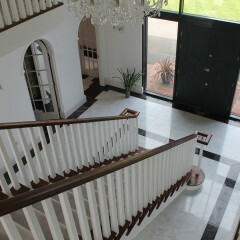 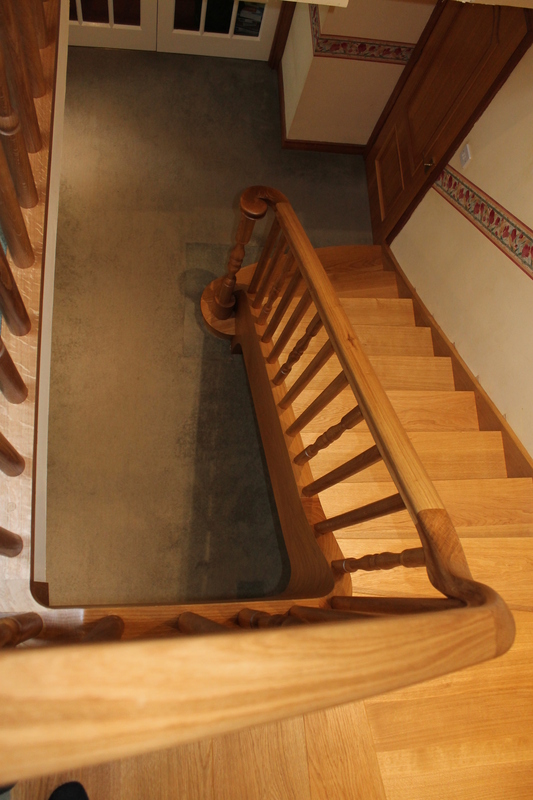 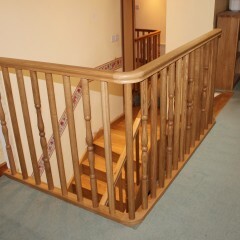 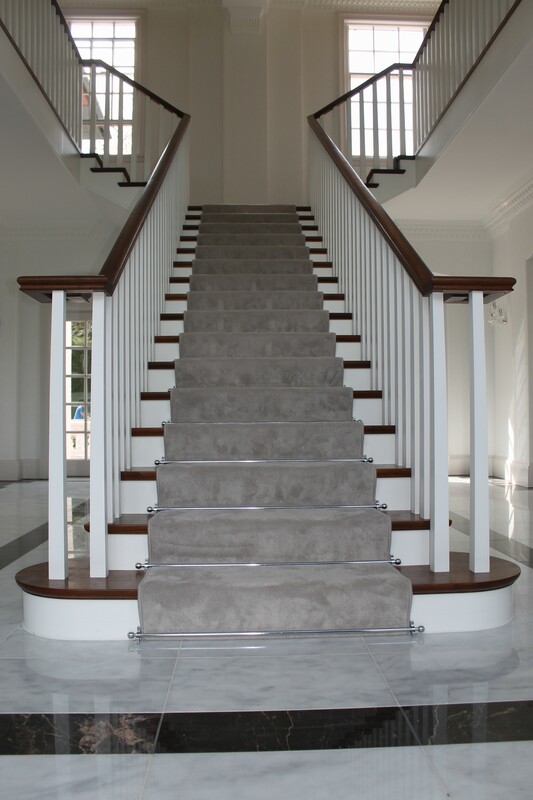 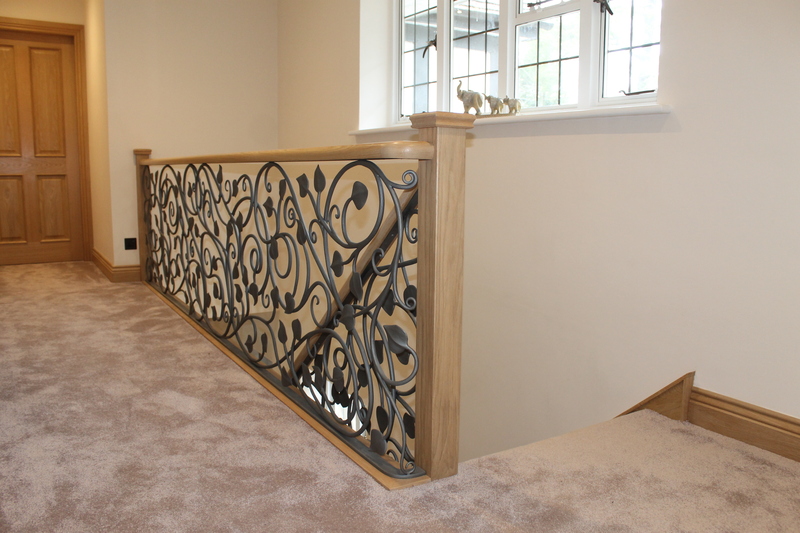 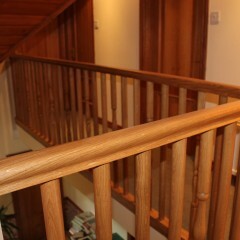 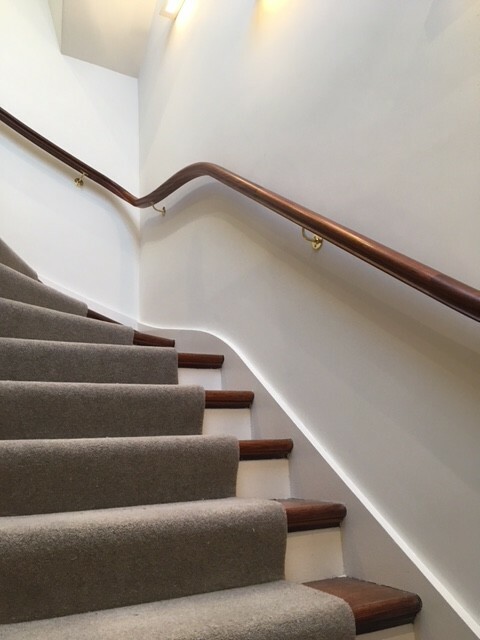 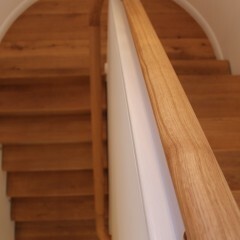 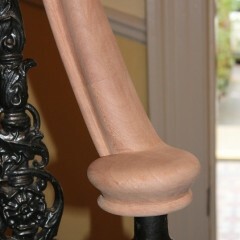 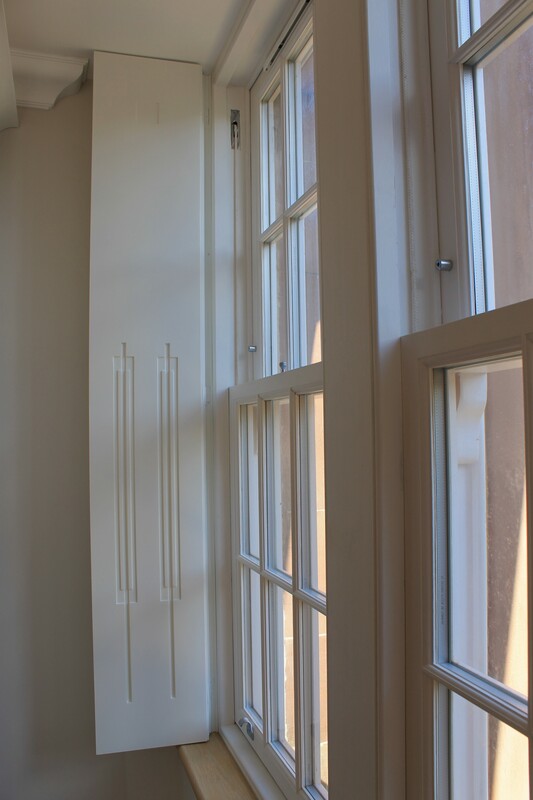 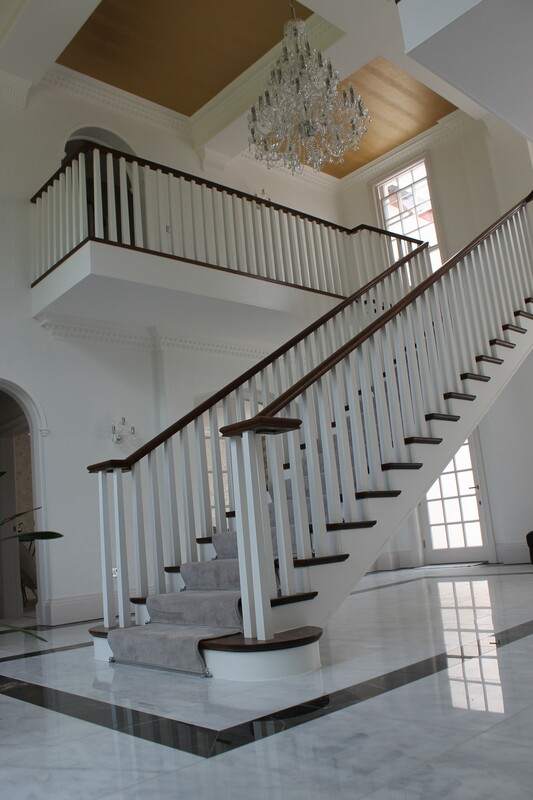 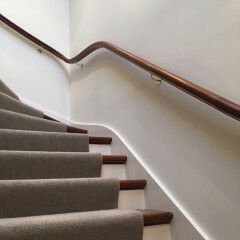 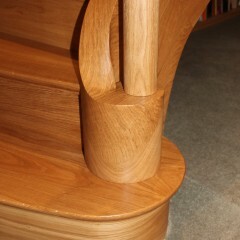 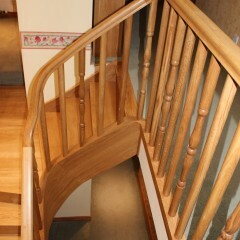 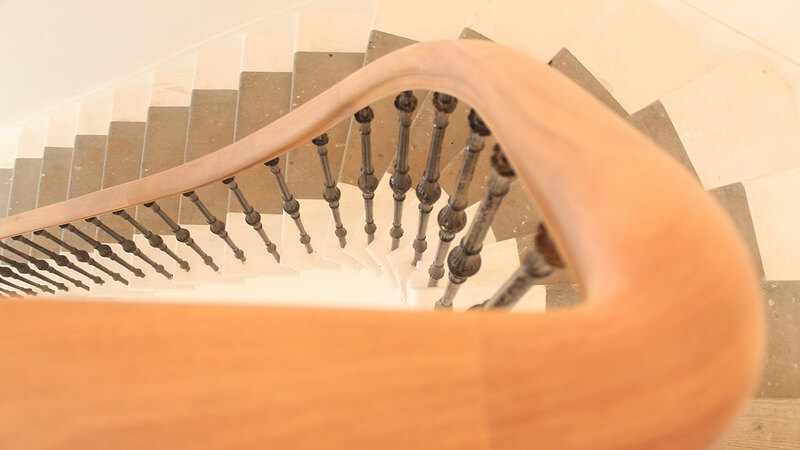 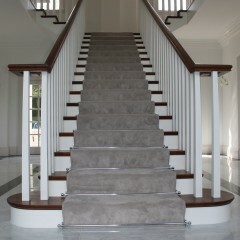 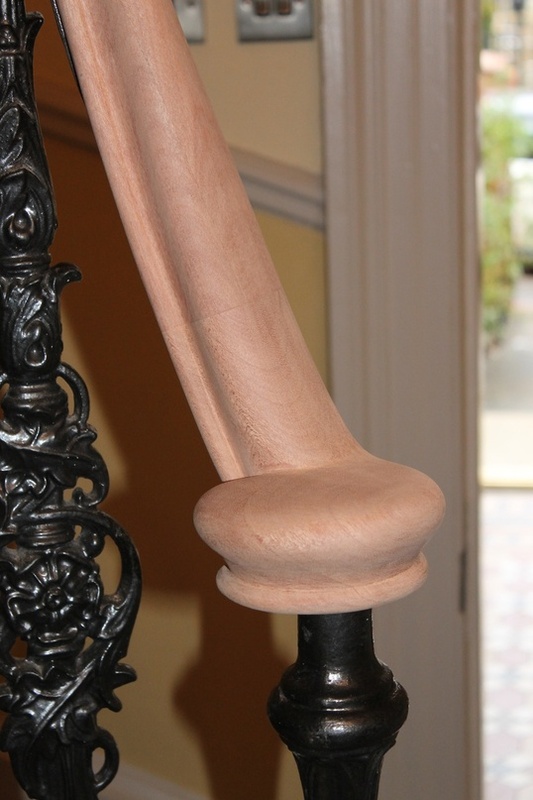 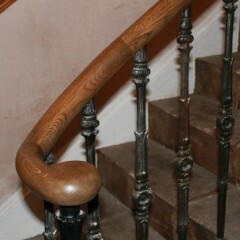 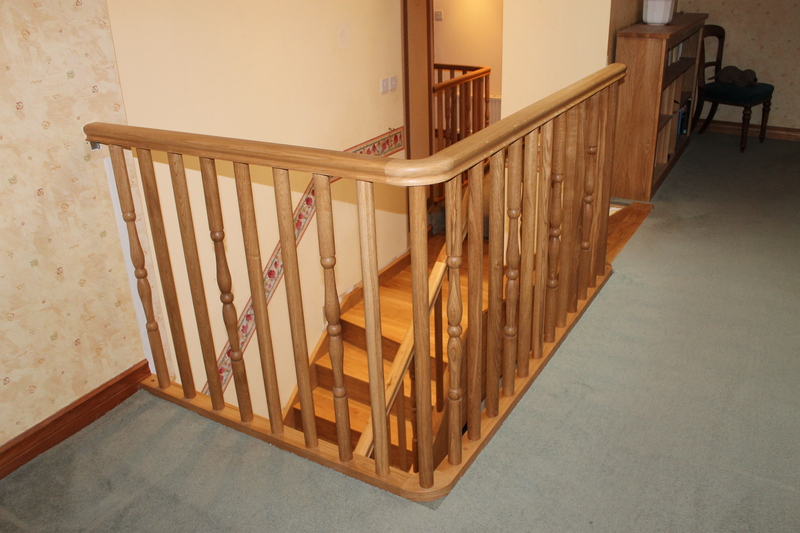 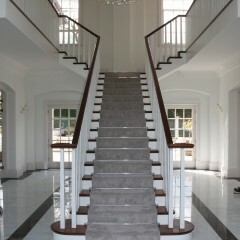 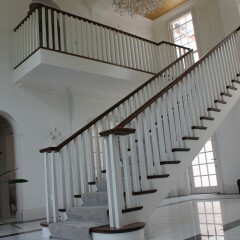 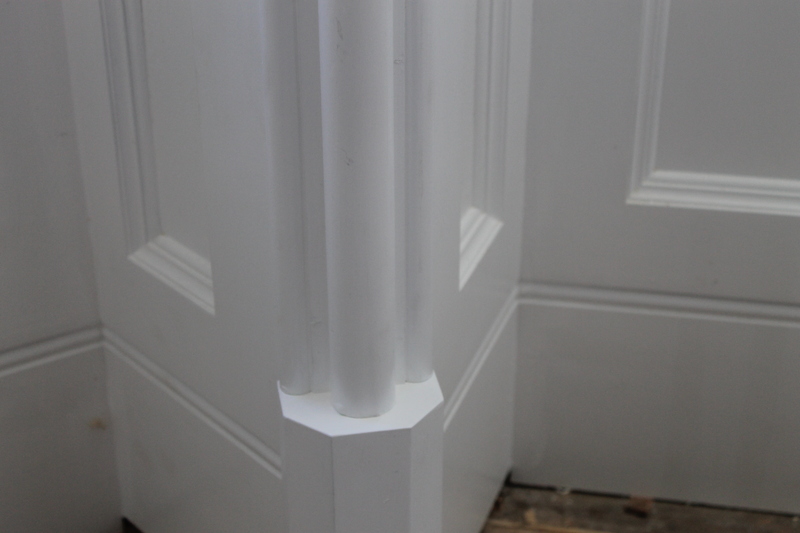 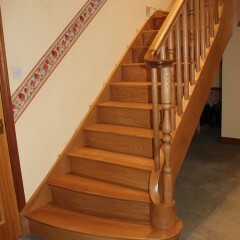 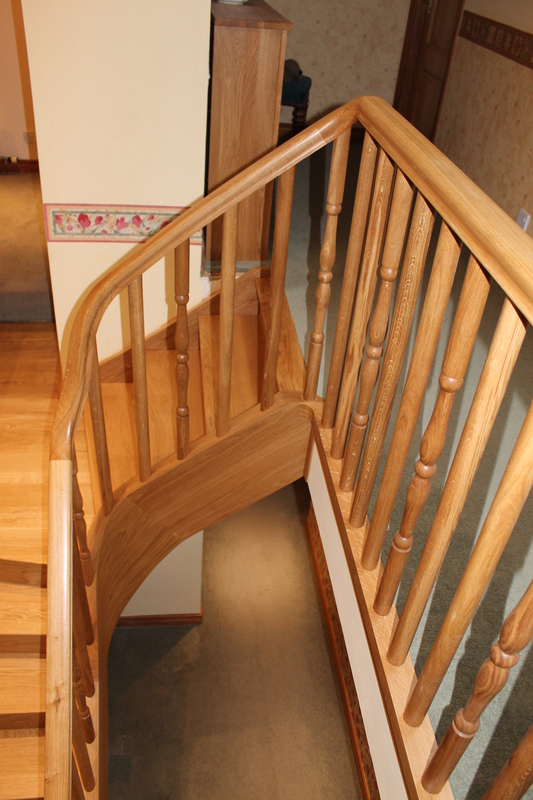 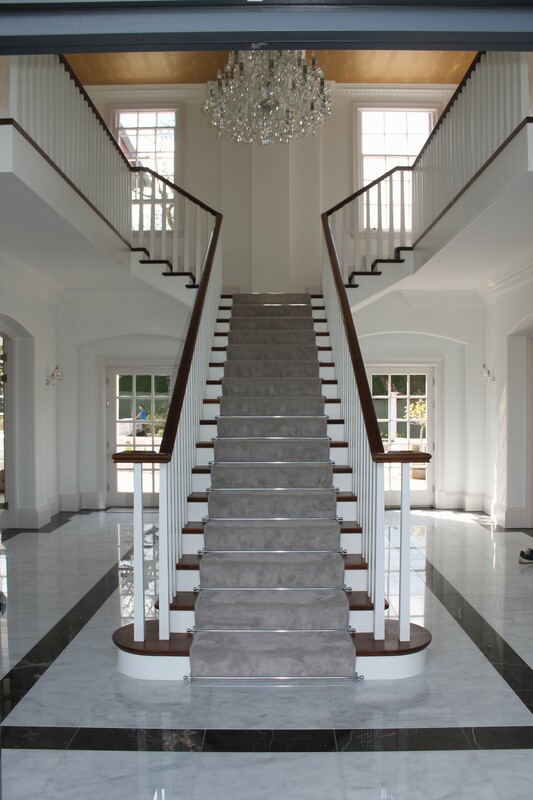 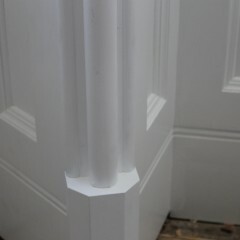 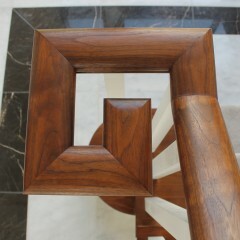 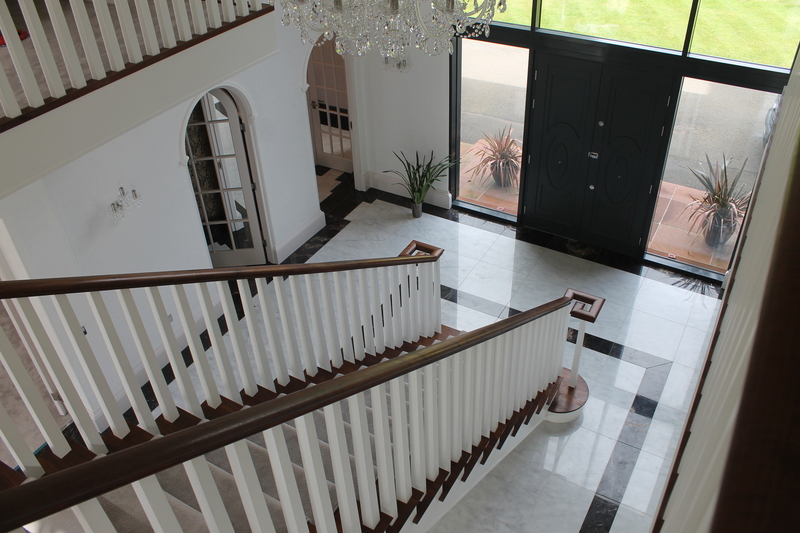 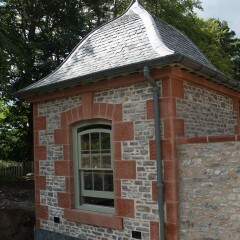 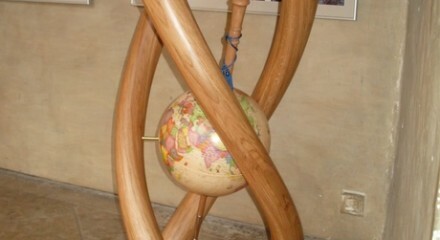 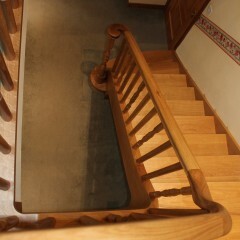 The finished work was of an extremely high quality and in keeping with the traditional metal spindles. 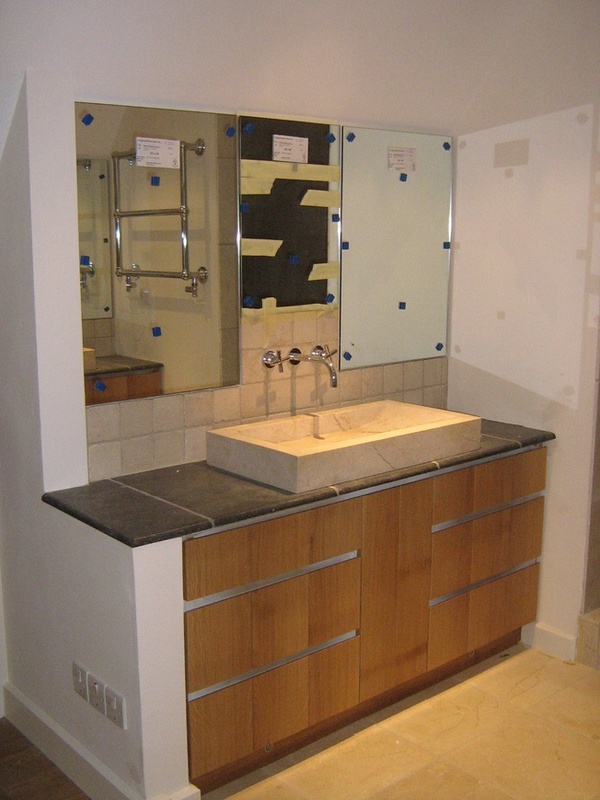 The work was carried out in good time and in a professional manner, and more than lived up to expectations. 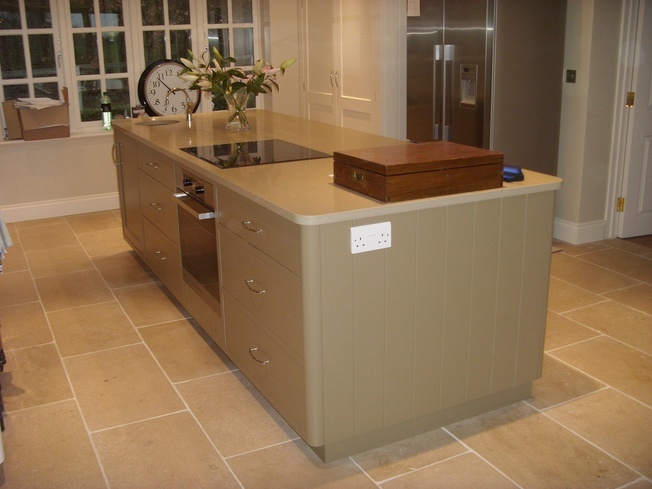 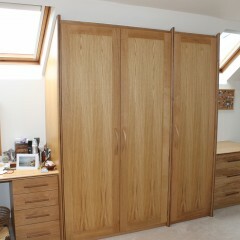 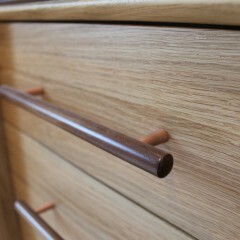 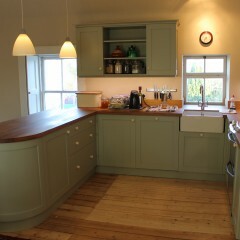 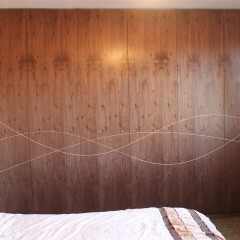 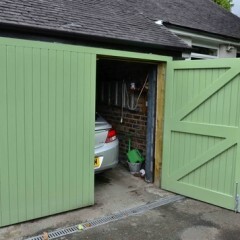 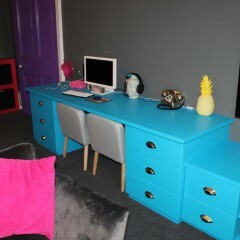 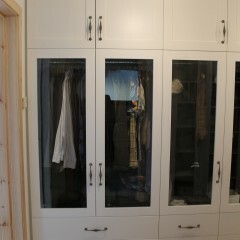 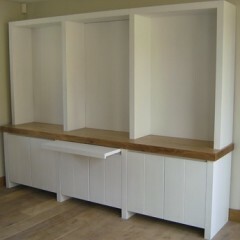 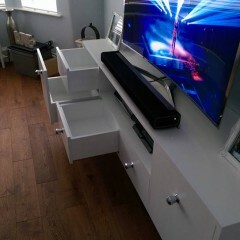 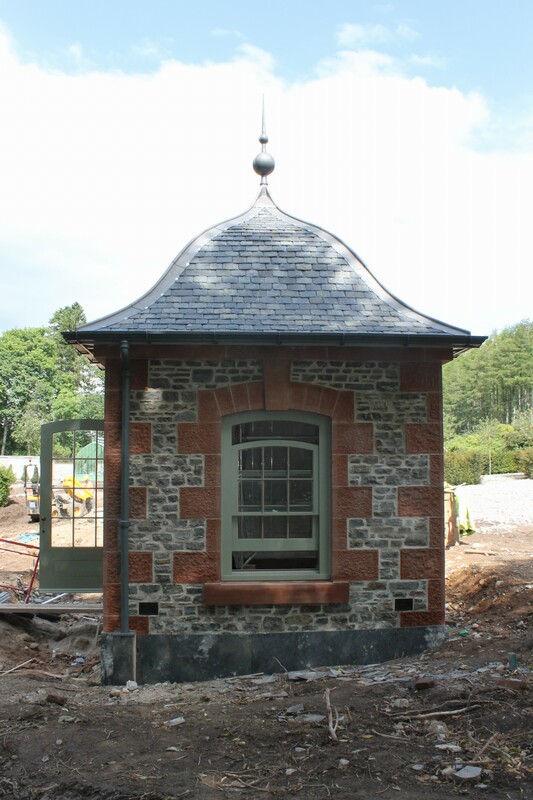 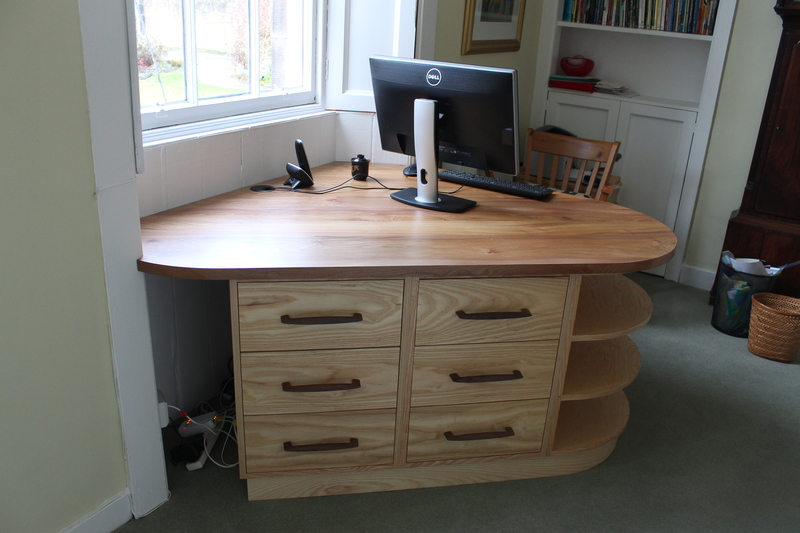 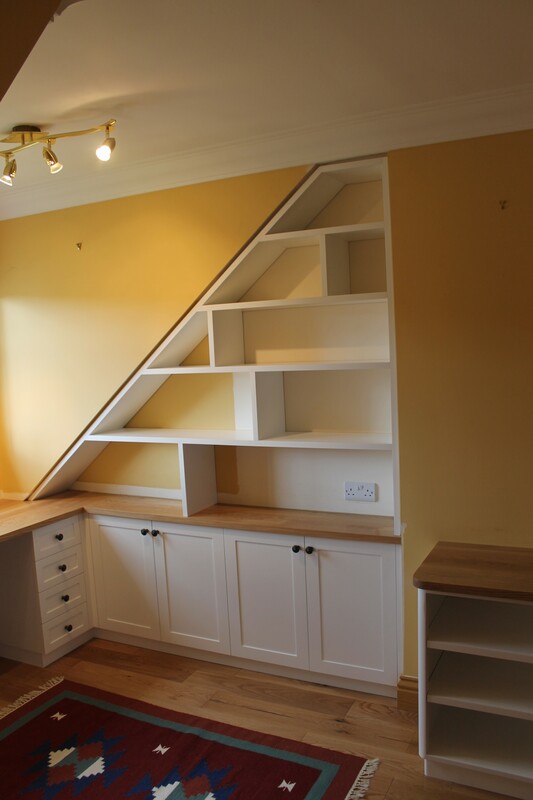 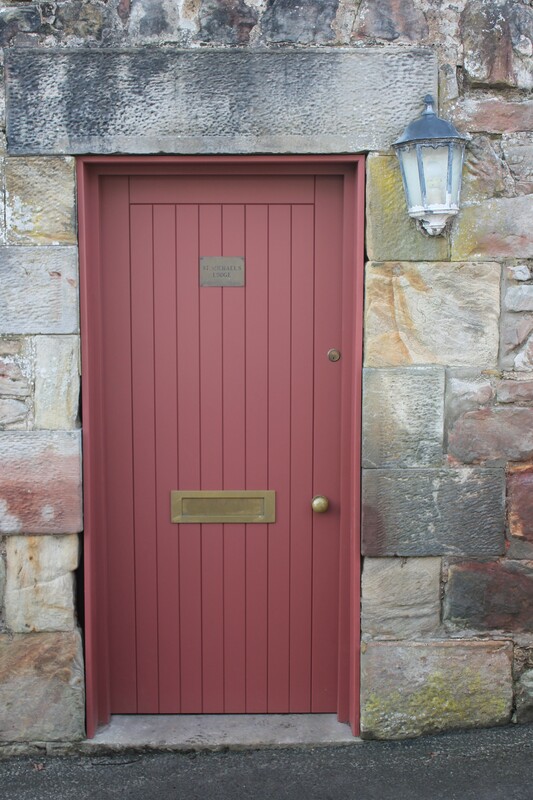 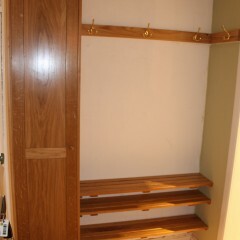 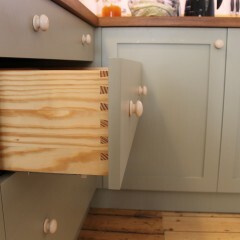 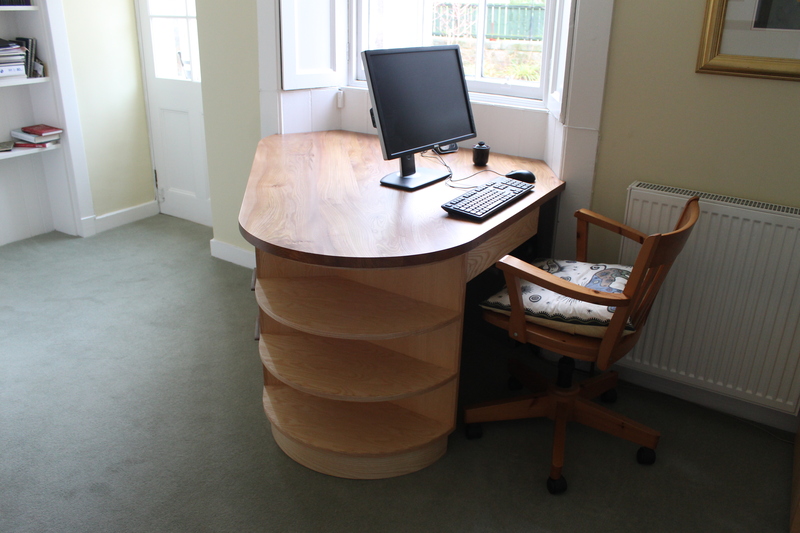 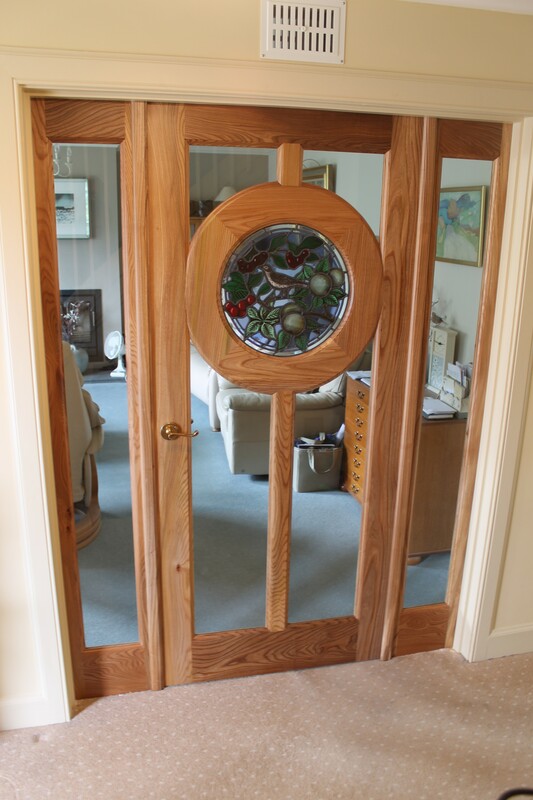 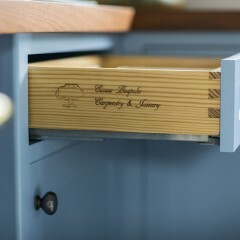 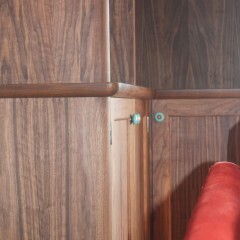 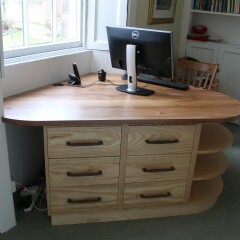 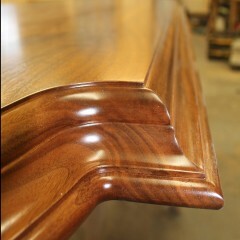 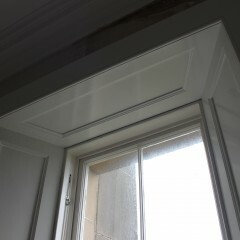 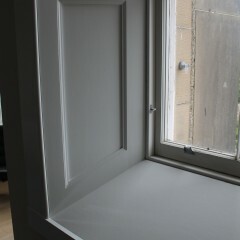 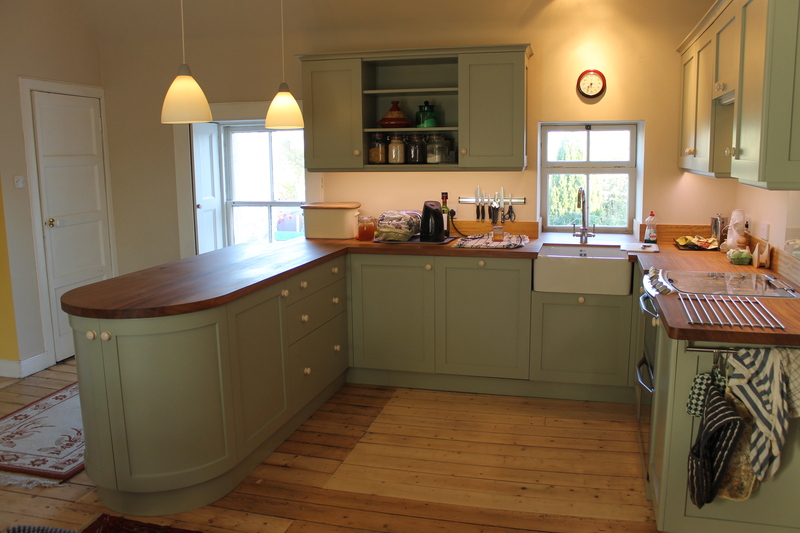 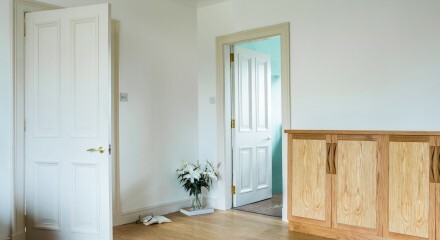 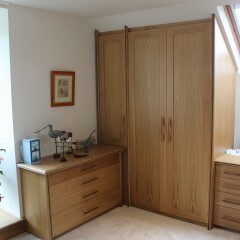 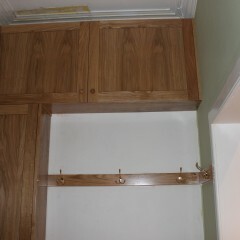 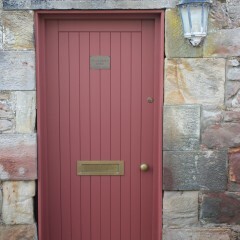 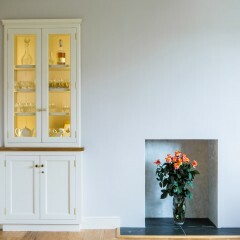 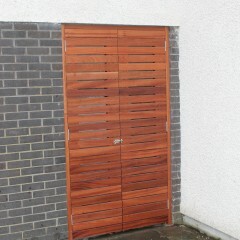 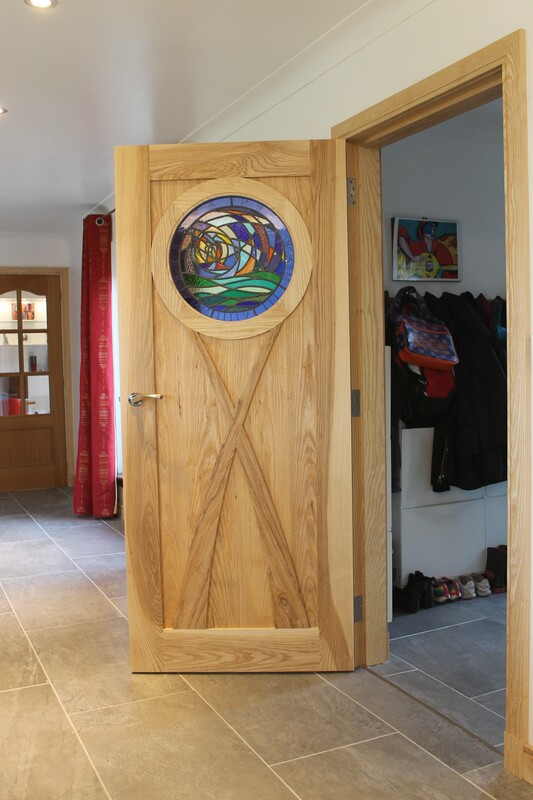 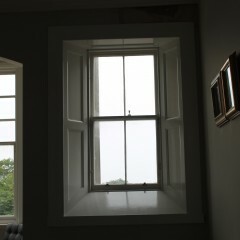 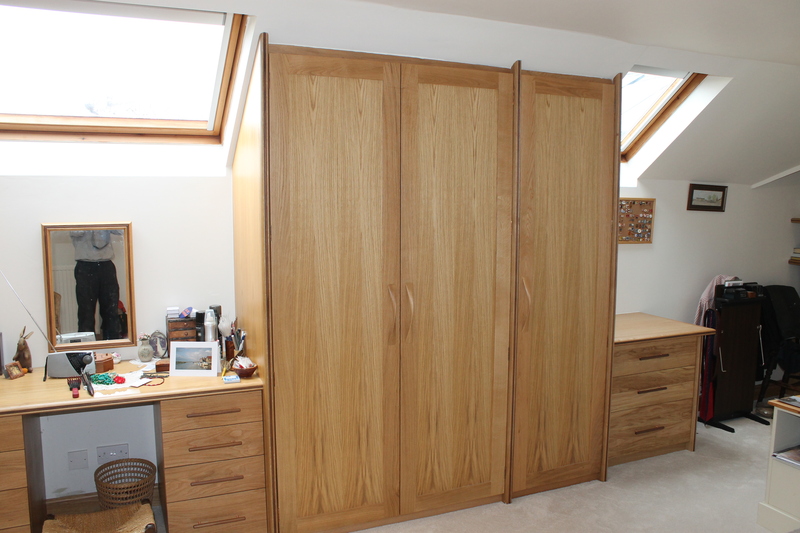 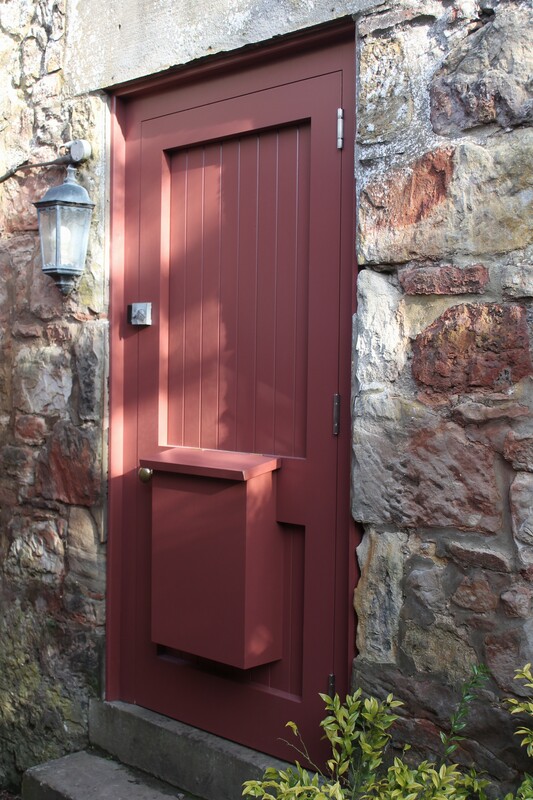 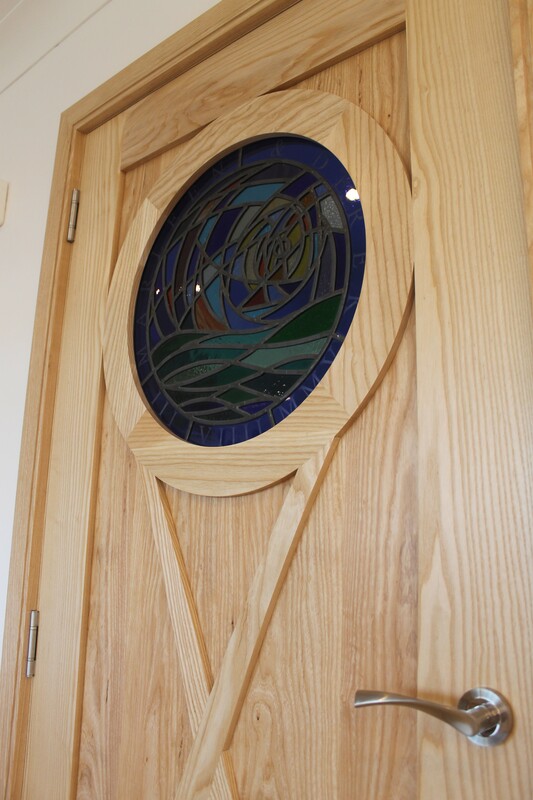 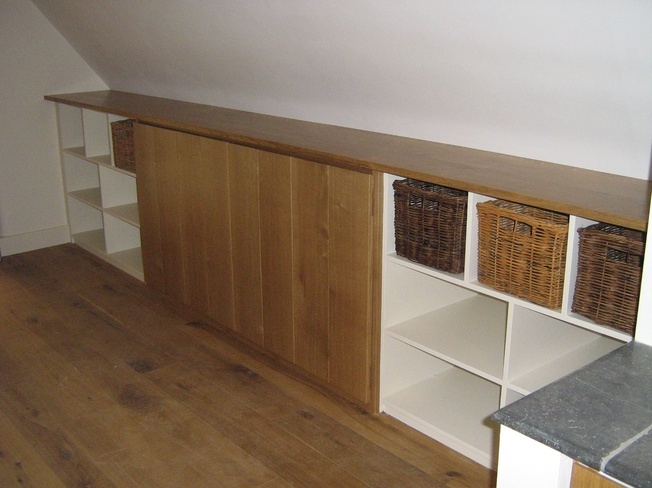 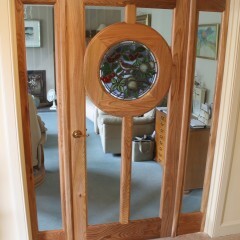 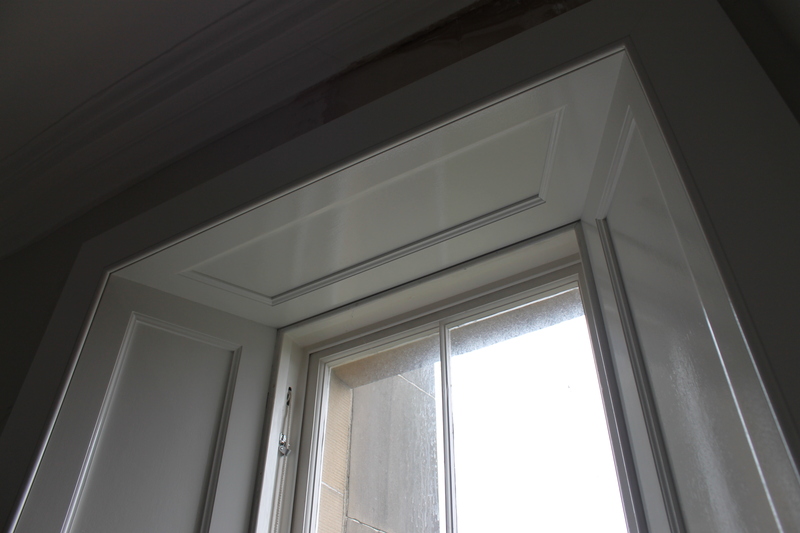 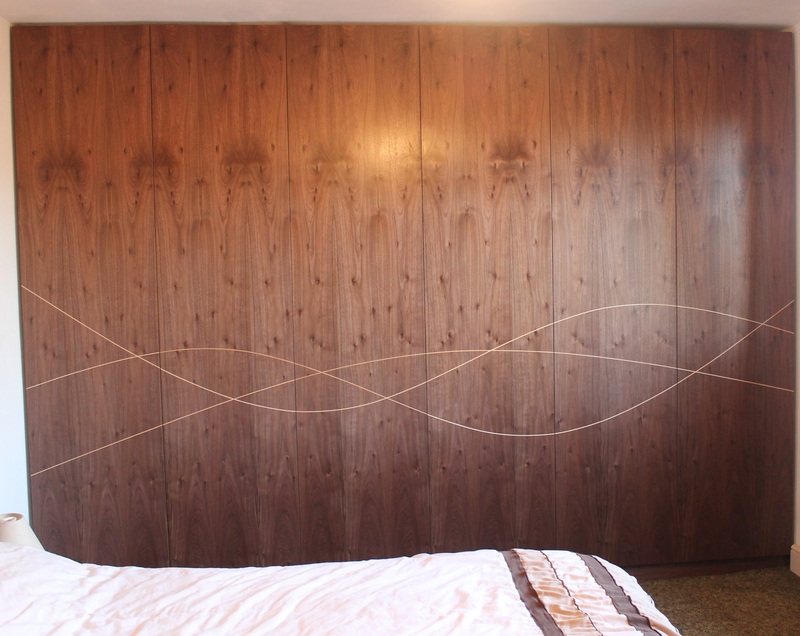 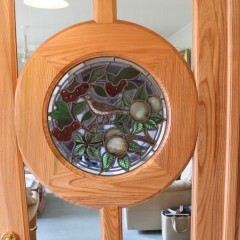 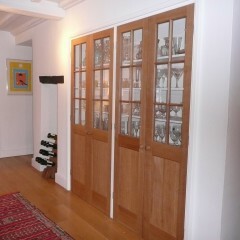 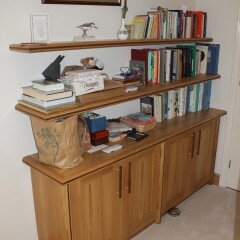 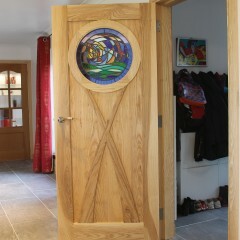 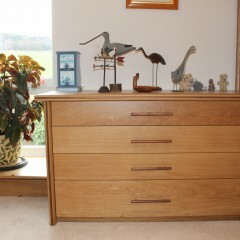 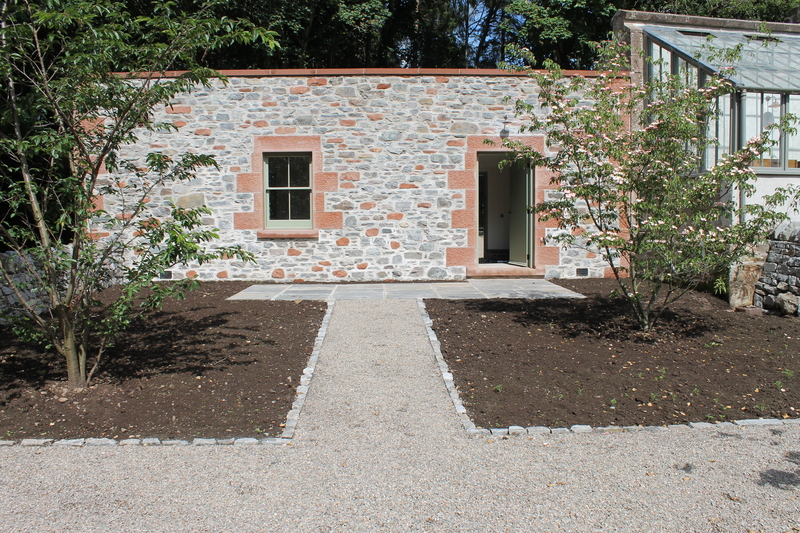 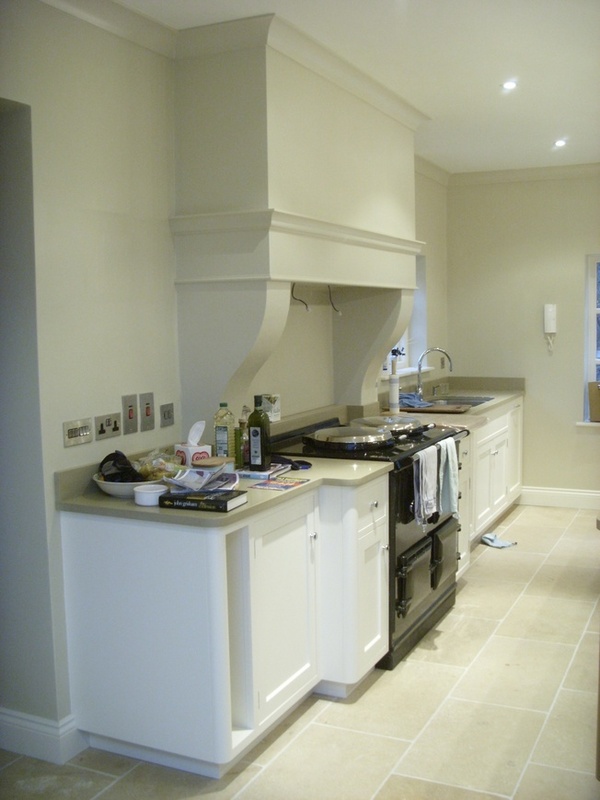 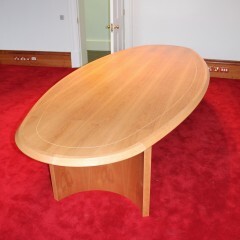 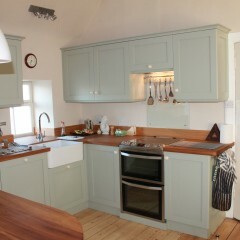 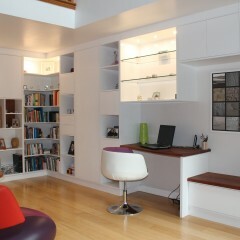 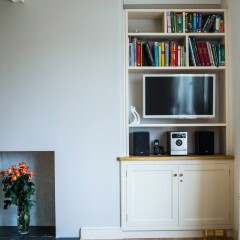 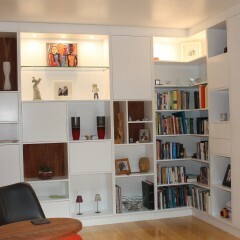 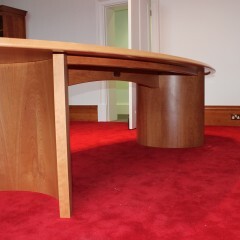 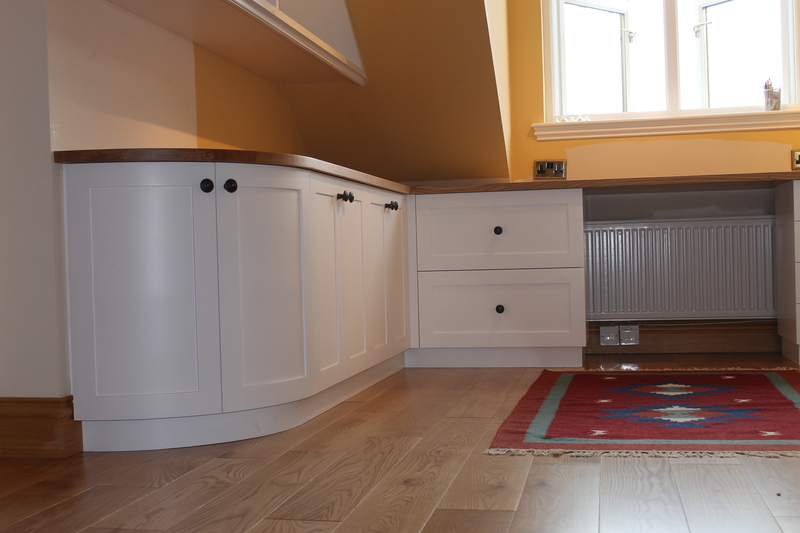 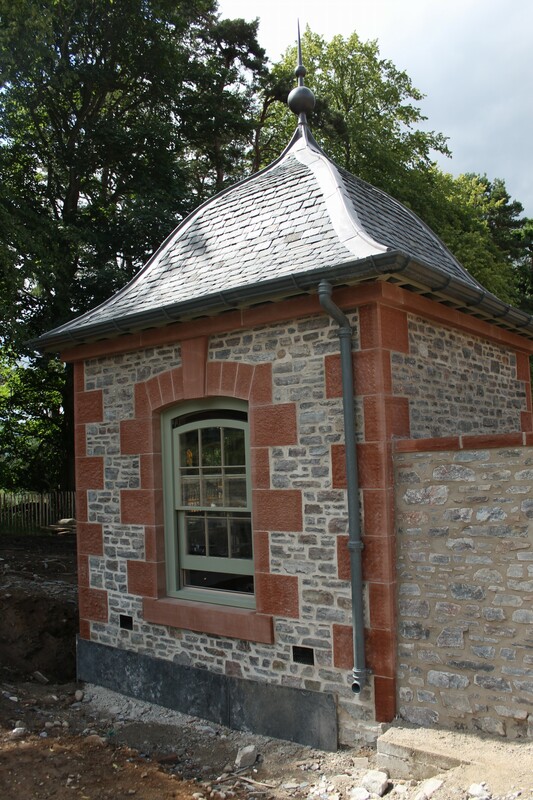 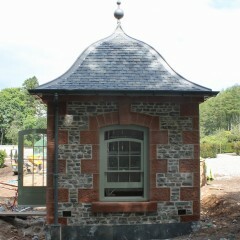 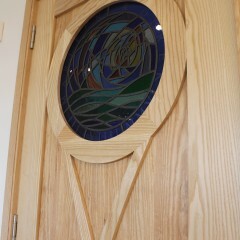 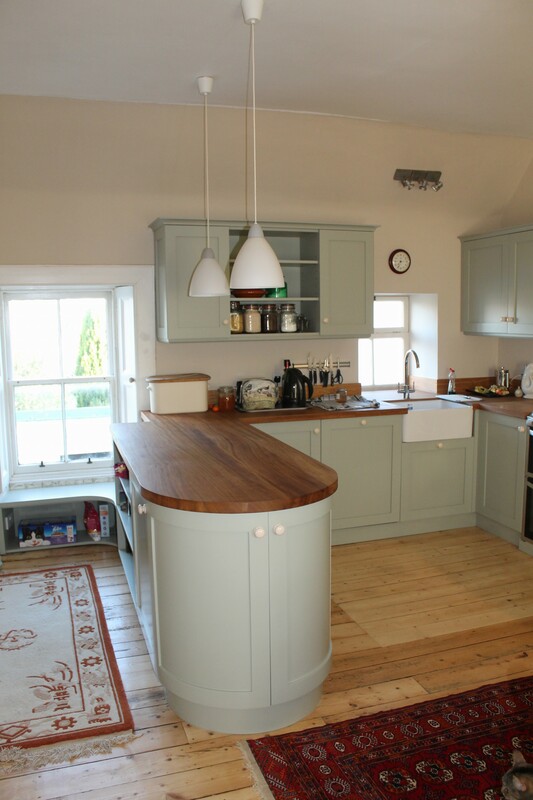 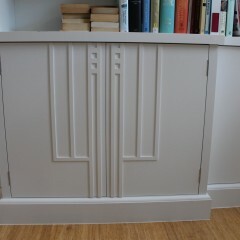 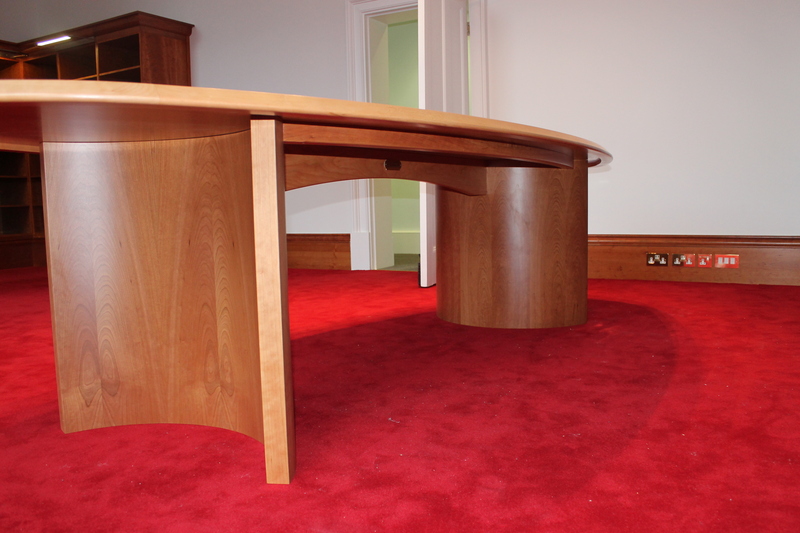 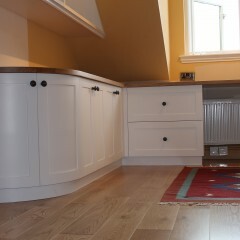 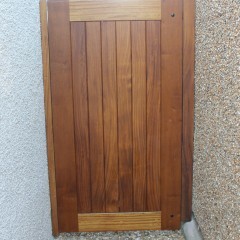 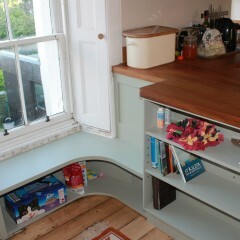 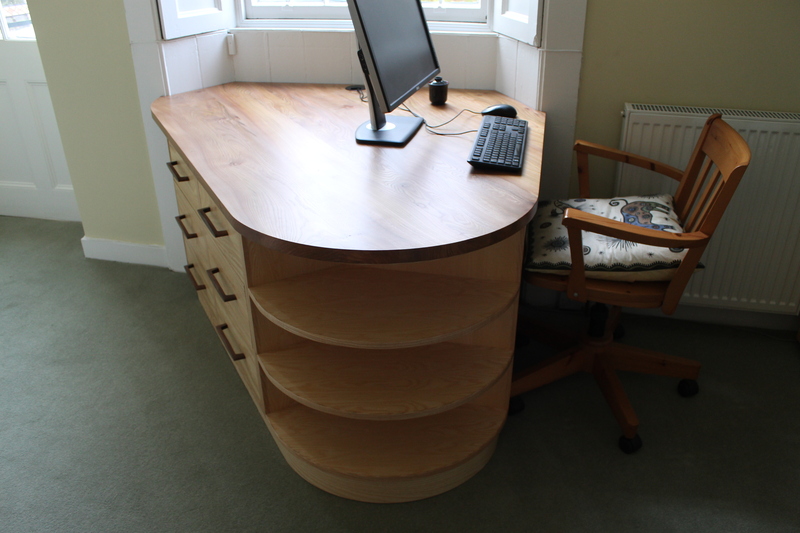 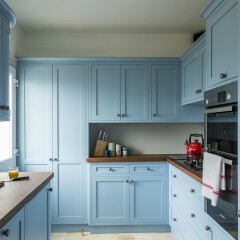 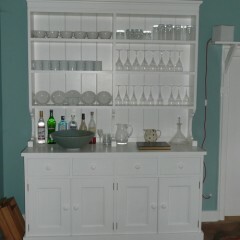 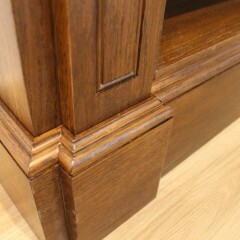 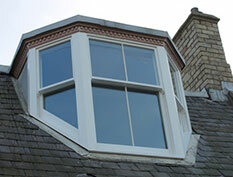 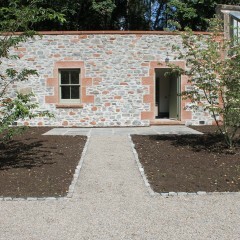 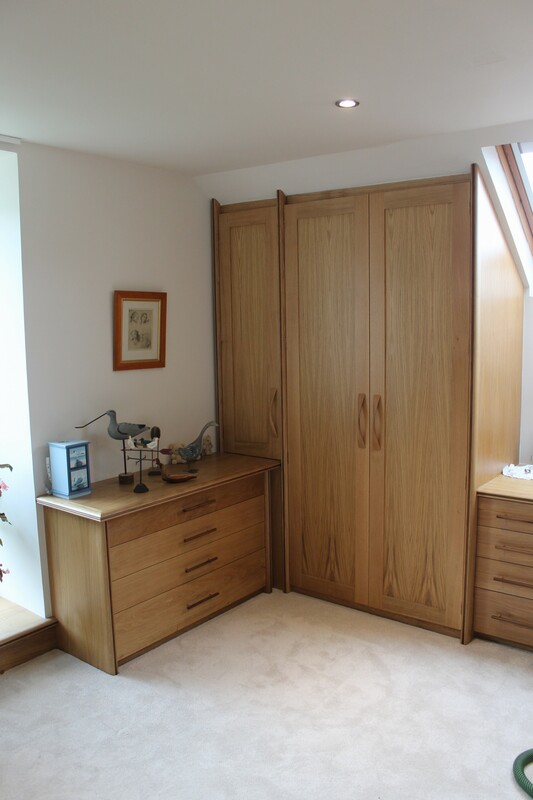 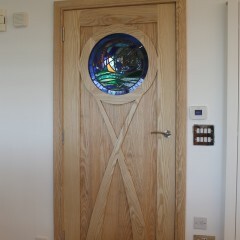 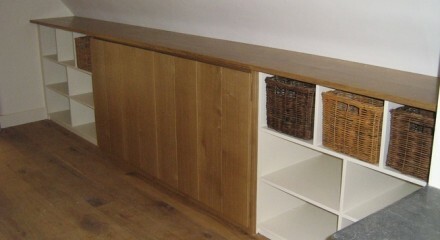 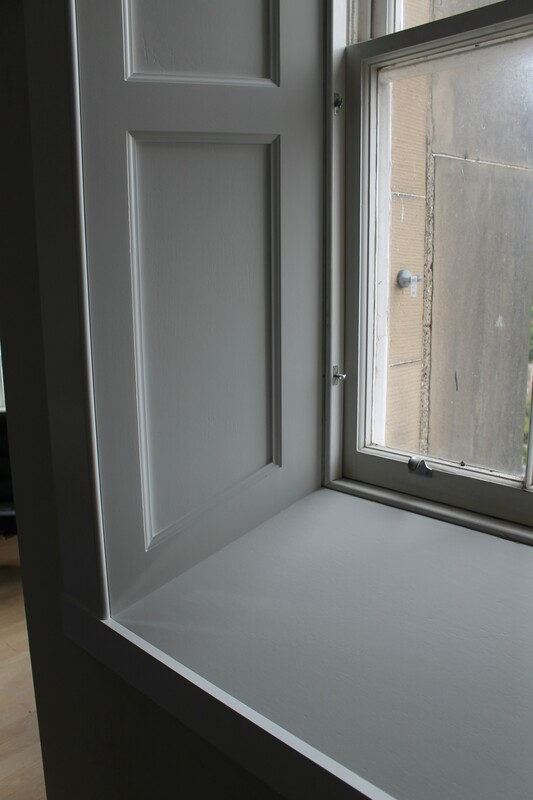 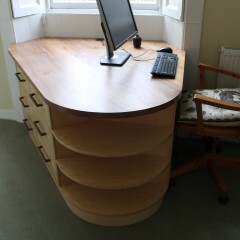 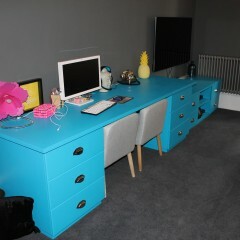 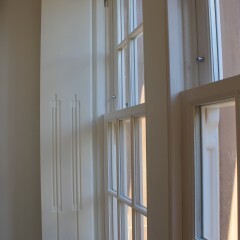 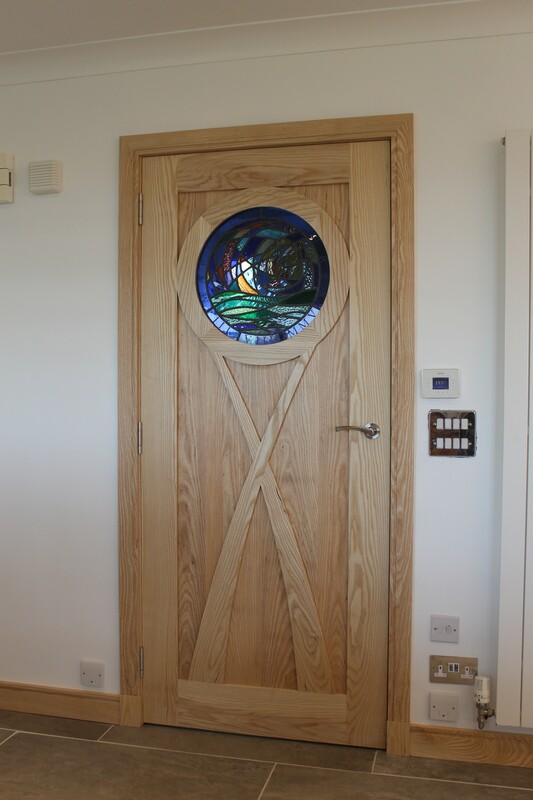 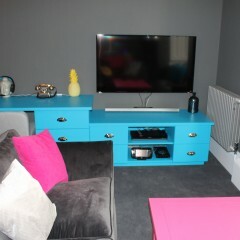 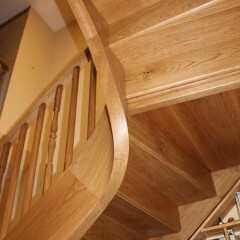 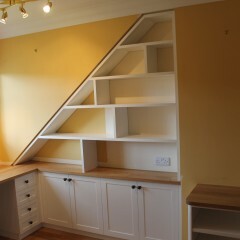 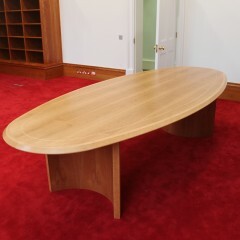 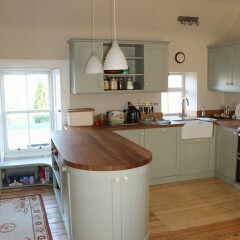 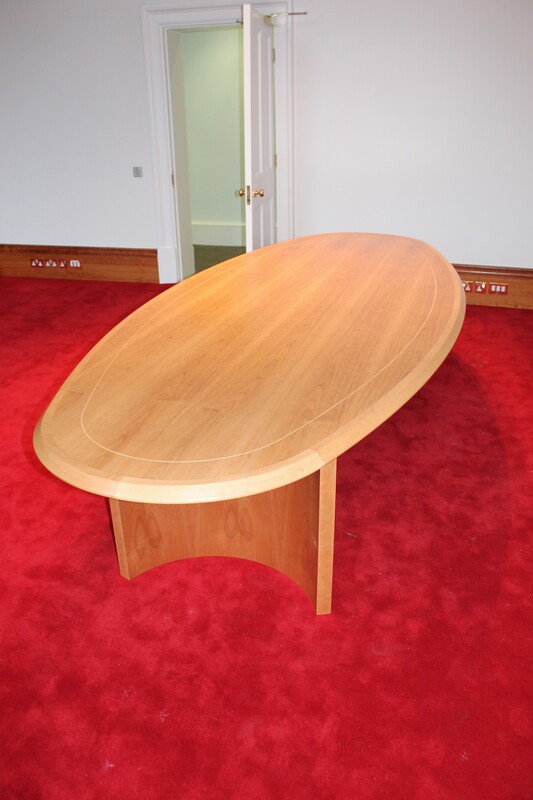 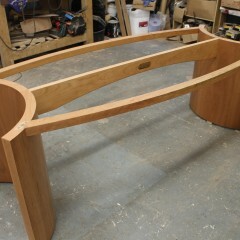 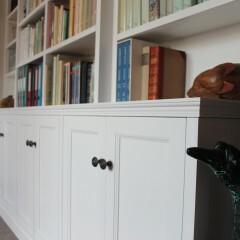 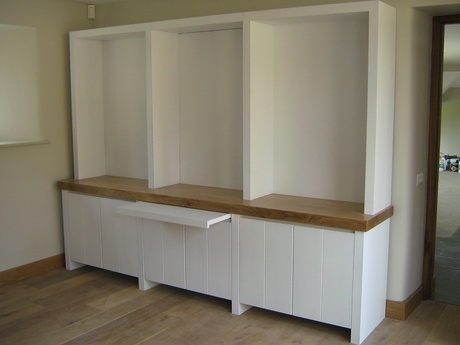 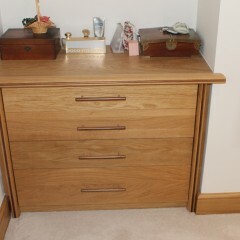 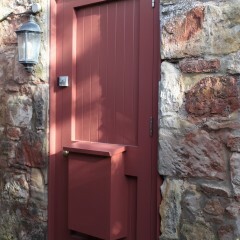 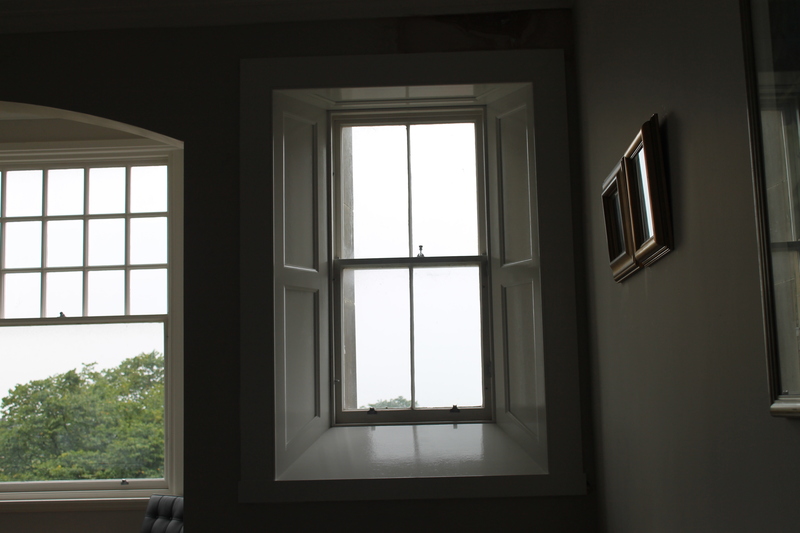 I would have no hesitation in highly recommending Ecosse Bespoke Carpentry & Joinery. 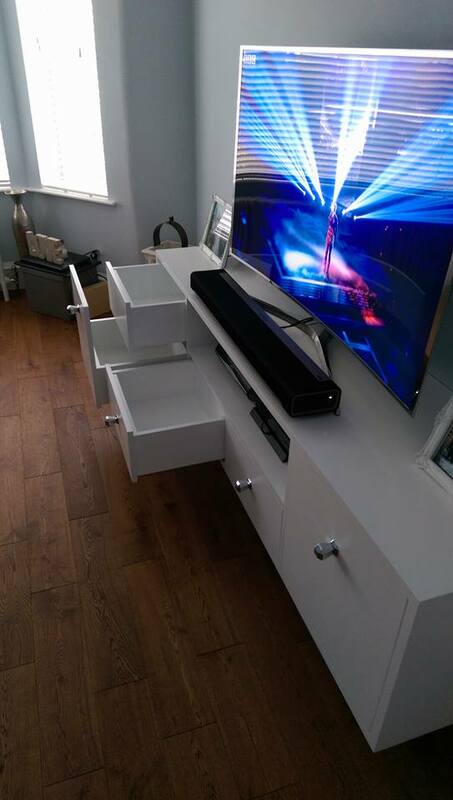 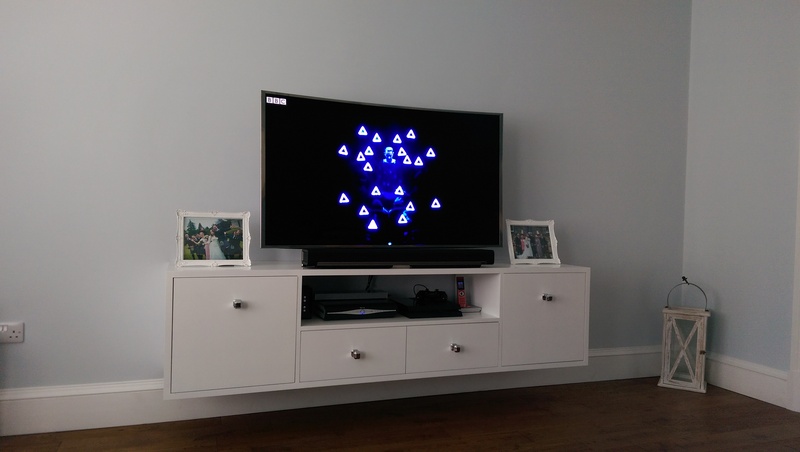 The finished product looks exactly as I had hoped and functions smoothly and easily, combining attention to both visual and operational quality. 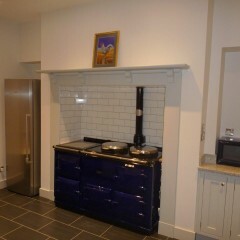 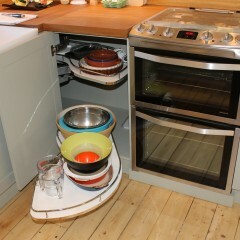 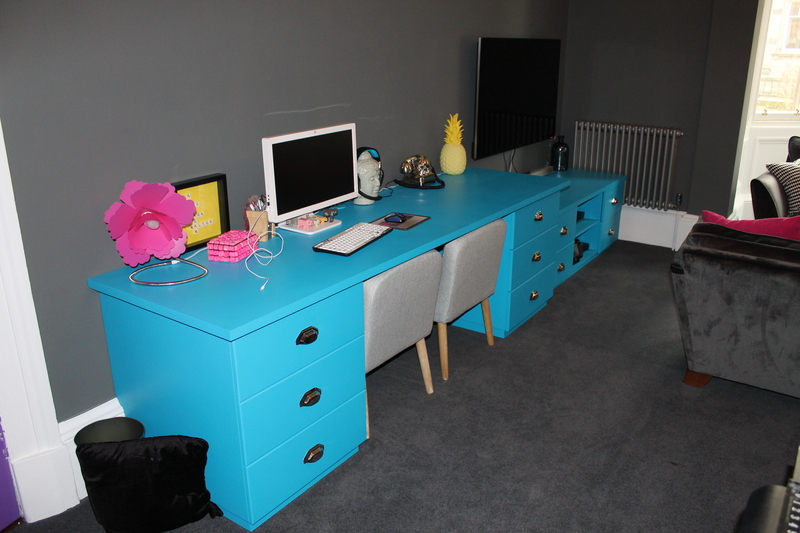 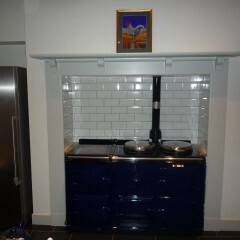 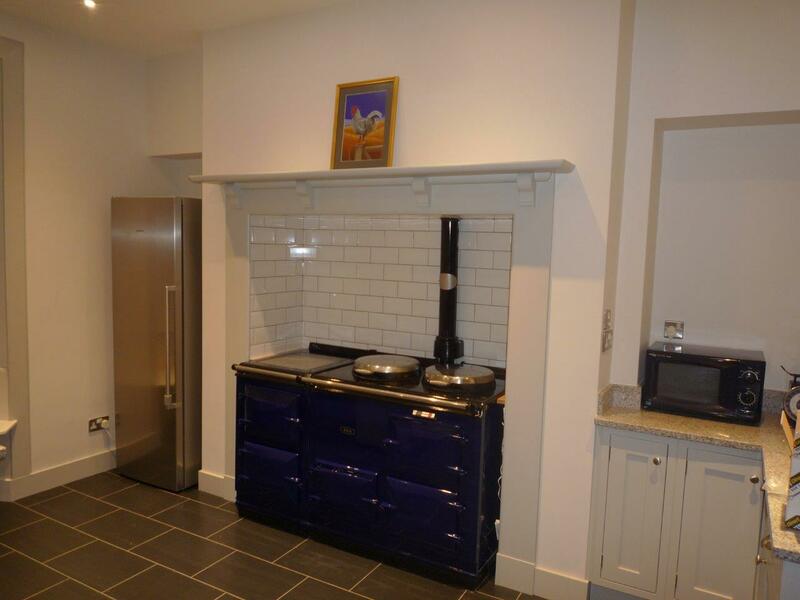 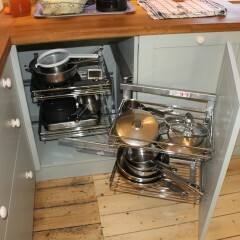 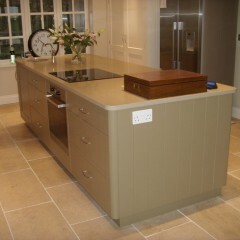 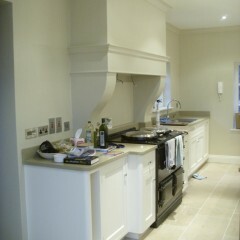 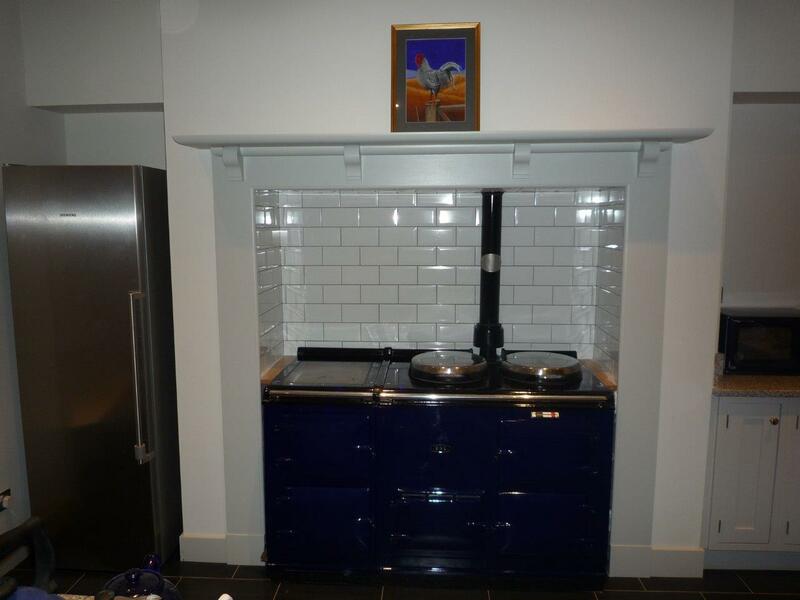 Altogether a great job carried out to a very high professional standard. 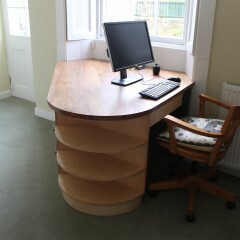 My thanks to Ecosse Bespoke.